I cannot tell you how tremendously glad I am it is Friday. We’ve had a really up and down week, with some big professional successes (HUGE project done, new opportunities, etc) and some personal stresses, so I am really grateful for a weekend off. I should also be getting my official MarathonFoto pics sometime this weekend, which I’m looking forward to. 🙂 You guys might be getting tired of all Star Wars all the time over here, so I’ll wait at least a week or so to share those, I promise. 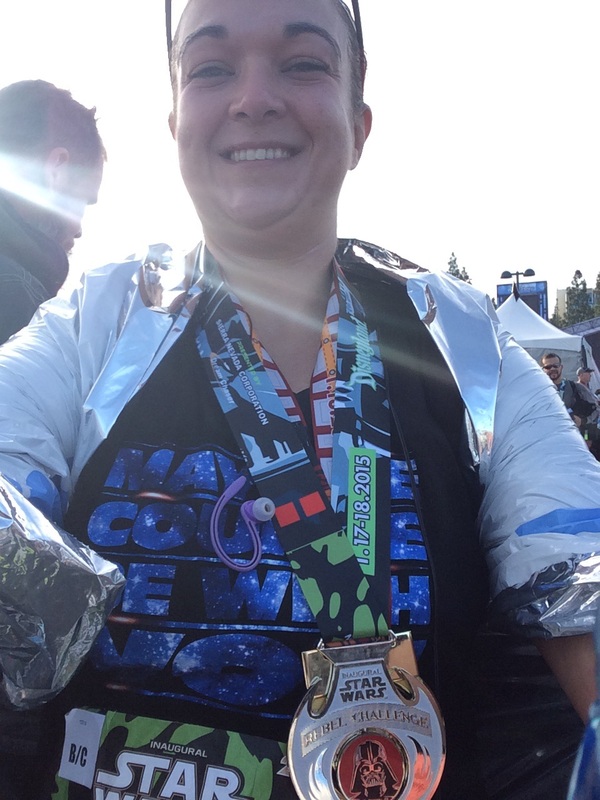 For my official last Star Wars related post for a while, I have to link Greg’s post honoring the awesome cos players who entertained along the half marathon. 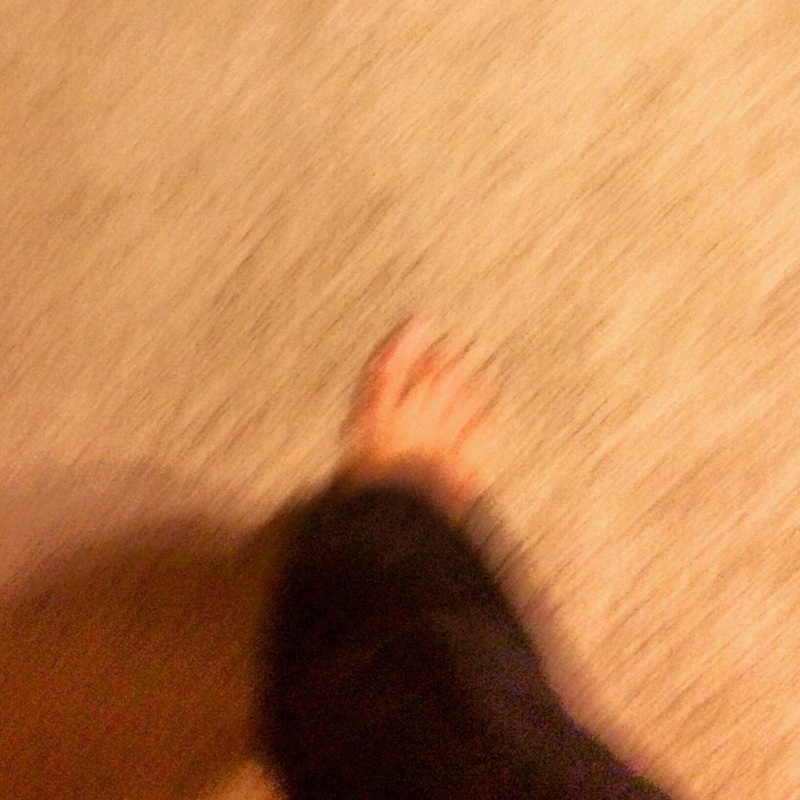 He took a ton of pictures, so definitely go check it out here. 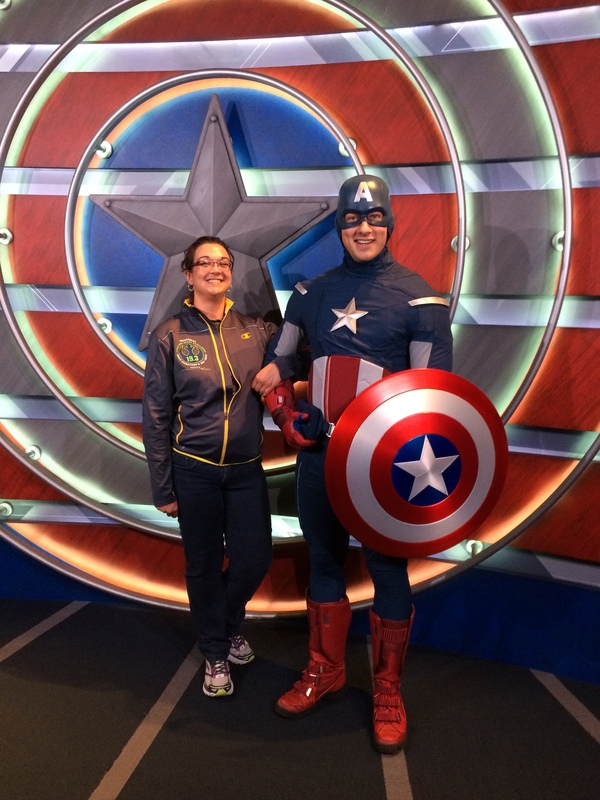 As a girl with some definite geek leanings (clearly), I love Desiree’s post about all of the awesome fitness role models in female geek-dom. A) She is totally right about Firefly and Serenity – definitely Firefly first and B) Now I definitely need to add Agent Carter to my watch list. Hopefully I can find the episodes I’ve already missed somewhere online? 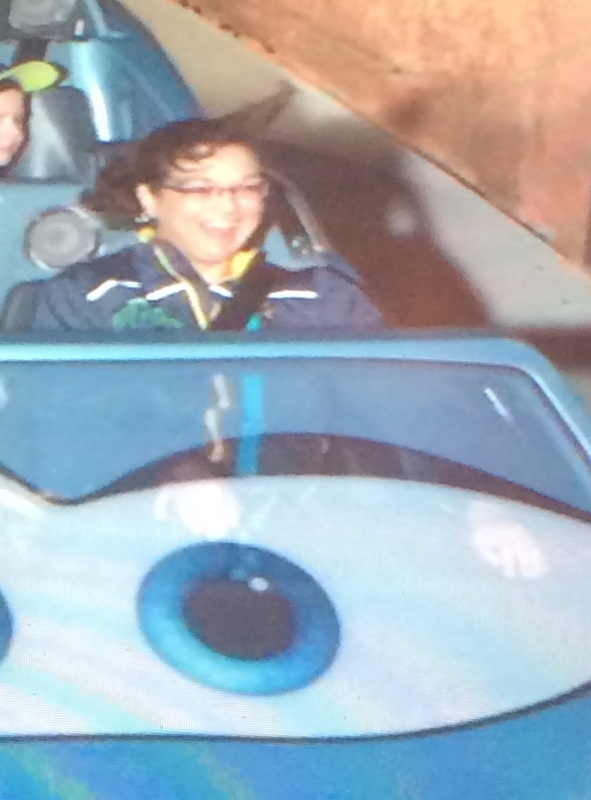 Random Disney Photo: Radiator Springs Racers is so charming and fun! At the beginning of the year, lots of us (me included) make a goal to focus more on quality food. Unfortunately, sometimes that gets really expensive. Laura’s post with tips on saving money on the things you buy organic is really handy and has lots of concrete tips. I’m considering adding the meat option to our local CSA order in the spring as we try to use more organic and antibiotic free meat options. 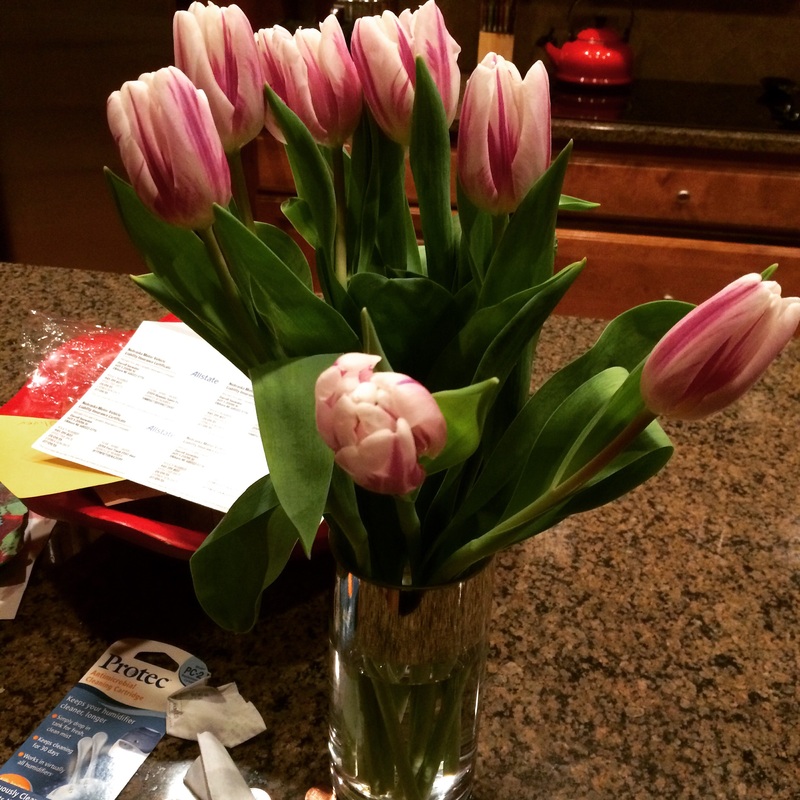 Thanks to Laura at ProjectLovelyLaura for leading me to the Fellow Flowers Declare It Day. I like any project that helps me to write down concrete goals (so powerful!) and LOVE that this is a February date, past the New Year’s sometimes-false-start of goal making. Definitely go over and check it out. 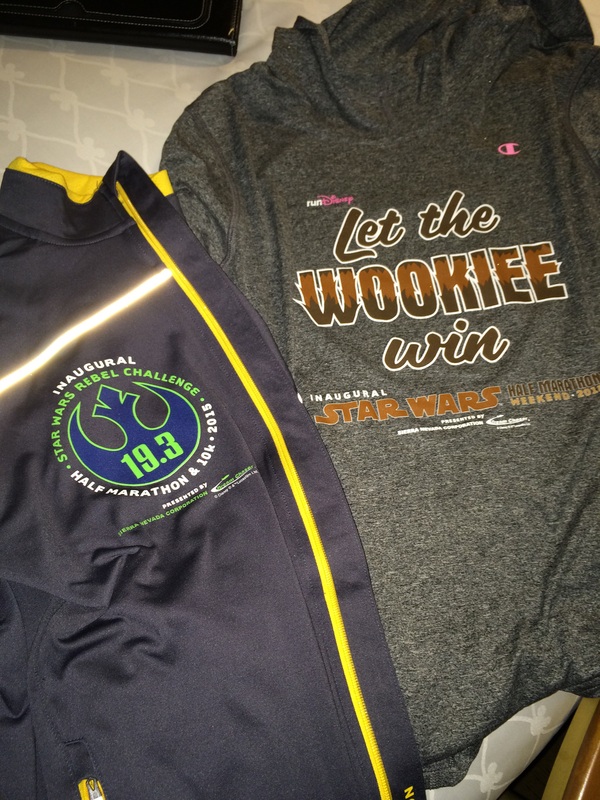 I’ll be adding my own goal – sub 2:30 half marathon here I come! Random Disneyland photo! I came around the corner and he was standing there with NO LINE! One last recommendation: If you have any interest in runDisney, the discussion in episode 70 of the Disney Dish with Jim Hill Podcast (iTunes link here) is a really interesting look back at how huge enterprise came to be. After such an up and down week, my goals for the weekend are simple: Run once, read lots and maybe treat myself to a glass of wine. After all, I’ve seen a post floating around on Facebook lately that says a glass of red wine is as good as an hour of exercise. 🙂 Have a good weekend everyone! One option when you’re registering for a runDisney race is to work with a travel provider for your race registration and other arrangements. 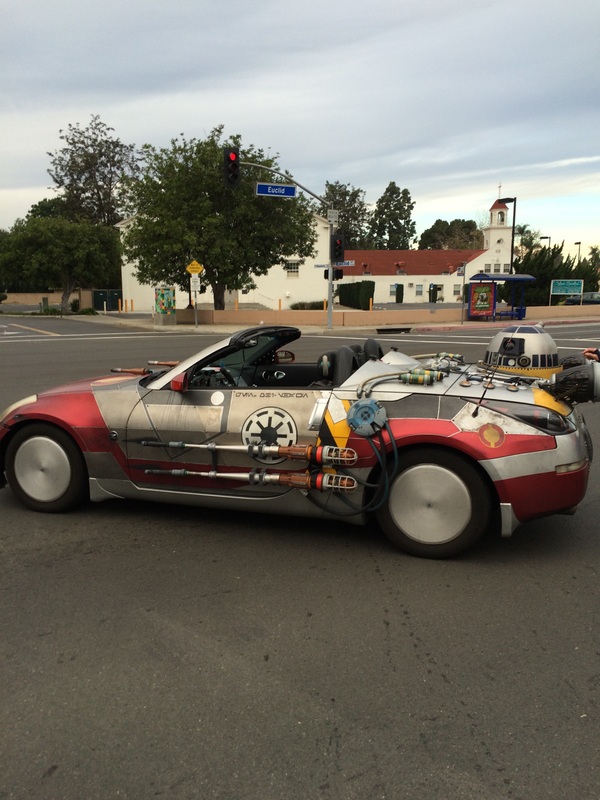 For the Star Wars race weekend, I decided to go this route and I thought some of you considering the same for future trips might like to know a little about how it worked. – First and foremost, by working with the travel provider, I got registered before they actually officially opened registration. That meant I didn’t have to worry about being able to log in while I was at work or the race selling out before I could get through, all of which I was (justifiably) concerned about as this was an inaugural race. – Secondly, the package offered by the provider I chose (GET Travel) matched, for the most part, what I would be interested in doing anyway in terms of park tickets, hotel choice and number of hotel nights, so it really wasn’t costing me anything extra (other than the Wookie Welcome party, which I wouldn’t have done otherwise) to use them. 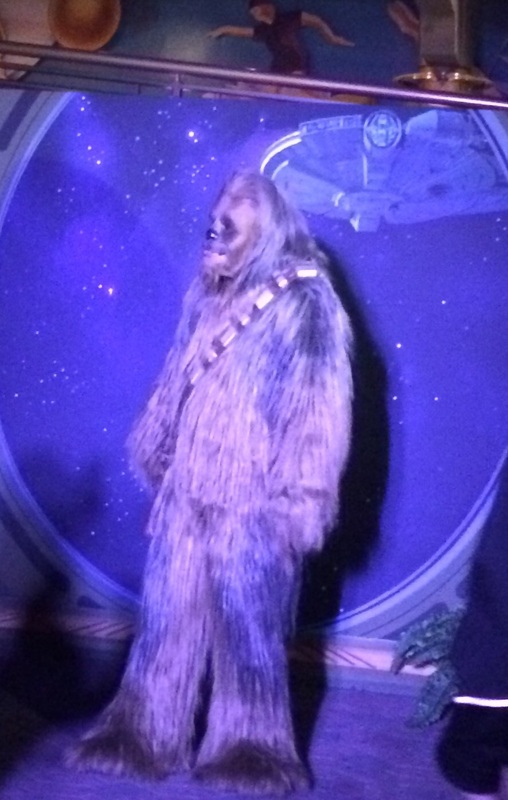 The cost for the Wookie Welcome party ($99) was mostly offset by a discount they offered on park tickets, so I wasn’t paying much more than if I’d done everything myself and skipped the party. If I hadn’t used the travel provider, I wouldn’t have gone to the Wookie Welcome party and wouldn’t have gotten to hang out in an essentially main street, so that’s something, right? I’m comfortable enough booking my own travel arrangements for things that I didn’t really need a travel agent to help with that, but for some people that may be another bonus in that they take care of arranging your tickets and hotel stay. Not having to worry about getting in during the registration rush was really the only plus of this process for me, but it was a big one and definitely worth it. I would absolutely work with a travel provider for a race in the future. – I couldn’t complete the process online and had to call, which took several tries before I got someone who could get me signed up. – After being initially responsive to questions on email when I was feeling out the idea, answers came much slower once I was officially registered. My biggest concern, as it was the first time I’d ever done this, was being sure I didn’t skip some other step I needed to take on registration day to be sure I didn’t miss my shot. That kind of reassurance is something you’d like very quickly as registration approaches and it was slow coming (but did eventually come – I’m just a control freak). 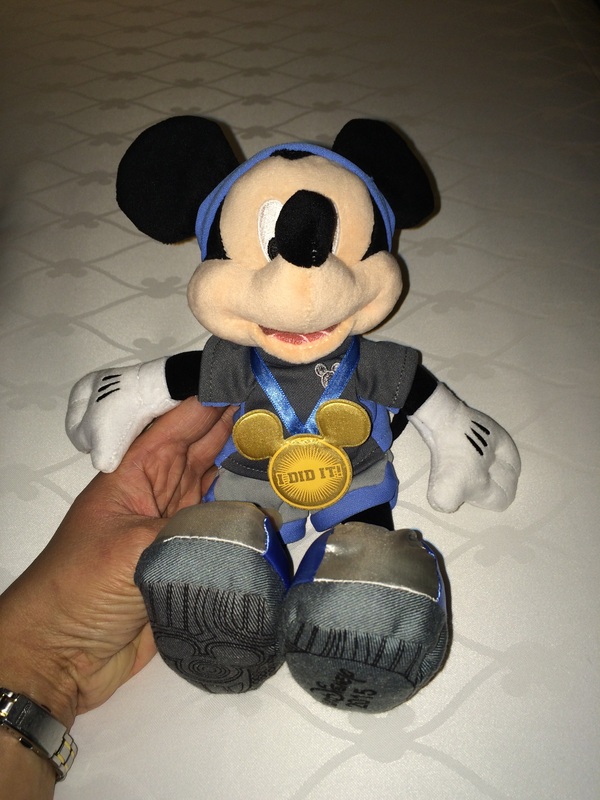 – I really didn’t get communication from runDisney until we got very close to the race, at which point the travel provider turns in their final roster for their registrations. It felt a little odd to be out of the Disney loop and I had a little fear that I wasn’t really registered until I finally got something from runDisney. On June 12, two days after registration opened (and sold out!) for the race, I got an email from the travel provider with a form asking me all of the Active.com questions like shirt size and proof of time. I was relieved to see that Coast to Coast was an option to select for the race, as I hope to use this race as part of my Coast to Coast medal with Wine and Dine this year. I was also able to update my proof of time in the fall, which I assume went through correctly given my corral placement, to reflect my time on the Peak 2 Peak 10 mile race. Instead of emailing TrackShack like I’d done for Princess, I emailed the travel provider and they updated the information. You don’t have direct access to your registration during this process, so they handle everything. Again, this caused a little angst for a control freak like me, but it all worked out. I paid the travel provider for the registration at the time I registered and then had to pay for the rest of the package (3 hotel nights at a Disney property, 3 day park hopper tickets, Wookie Welcome party) before the trip. 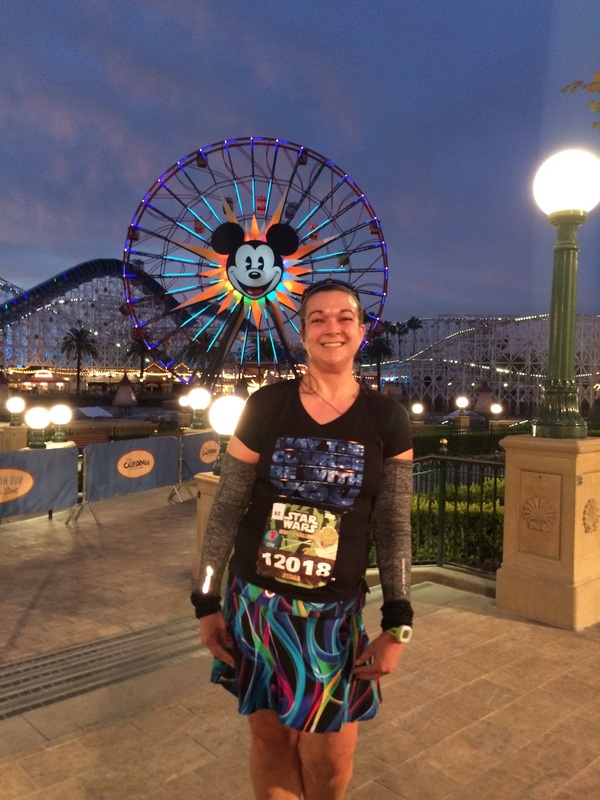 I did get a final statement showing I’d paid everything and had my registration noted, which was reassuring, and shortly thereafter started getting runDisney emails. Be aware that for most of the travel providers, the race registration part of the package is non-transferable and non-refundable. Be sure you clarify that with your particular provider. When I got to California, the only extra stop I had to make because I’d worked through a travel provider was stopping to pick up my park ticket at a booth in the Expo. 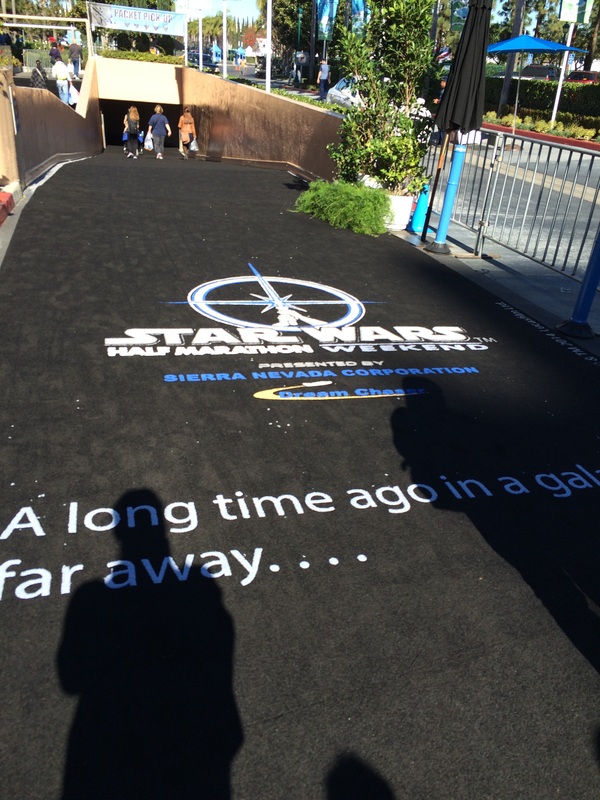 This was down in the lower level with the packet pick up and Wookie Welcome party booths, so it was a quick and easy stop. Otherwise, it was just like any other packet pick up I’d done. I’d gone online before the race (about a week before), looked myself up and printed my waiver. My name was in all of the binders for the race and the Wookie Welcome party without any notation or extra step I had to take because I’d been registered by the travel provider instead of registering myself. 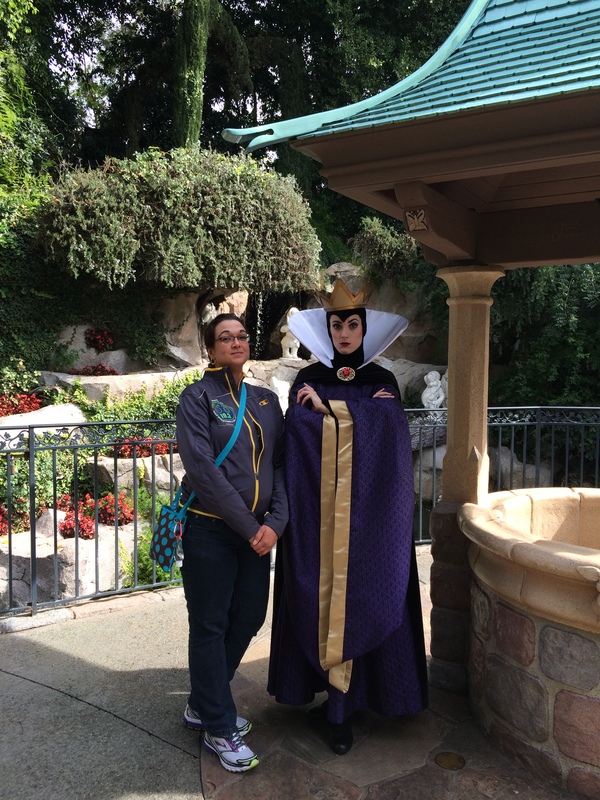 Random Disneyland pic of the day: I came out of Sleeping Beauty’s castle and found the Queen just hanging out by the well! No line or anything. 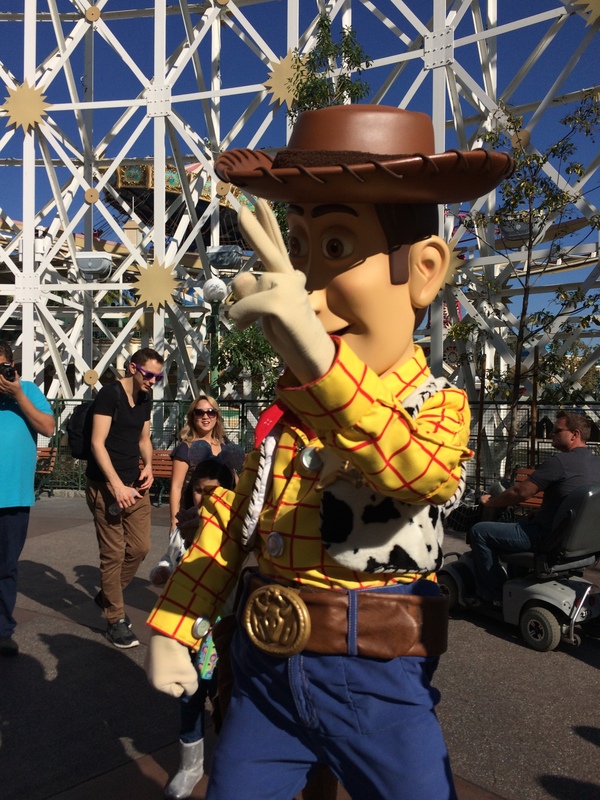 Loads of character interactions in Disneyland! I would definitely work with a travel provider again and may for Wine and Dine weekend. 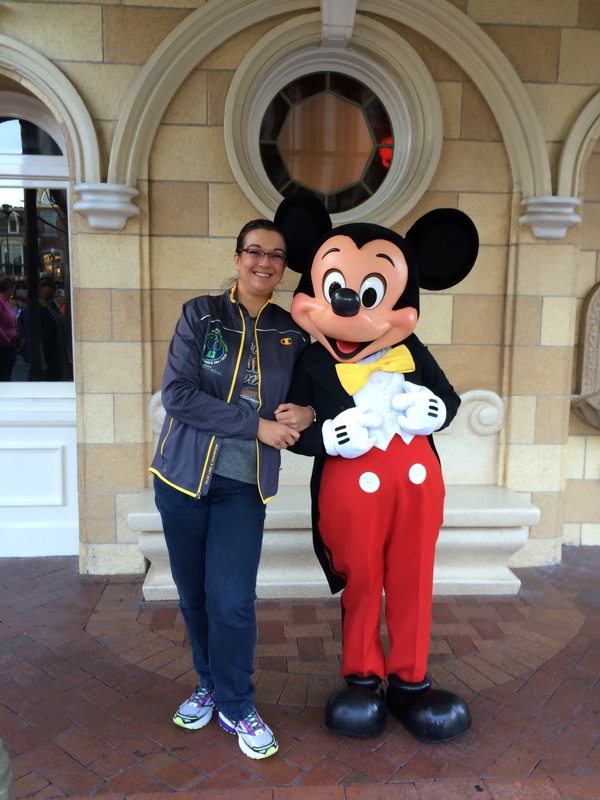 The biggest plus is avoiding the registration rush and so long as the provider has a package that meets my needs, that’s absolutely worth it as crazy as runDisney registration has gotten! – Be sure you know the terms of refunds and transfers, so you know what you’re getting into. I don’t know if you’d be able to do a deferral if you needed to, so ask your provider and factor that into your cost and possible travel insurance decisions. – Be sure you know exactly what the package they’re offering entails, as every provider is going to be a little different. If you’re going to pay for a lot of extra frills or there are going to travel restrictions/specifications different from what you’d normally book, it may not be worth it. – Be sure to check out the provider’s reviews. While we’d hope nobody would be linked to the runDisney official provider site if there were any questions about the level of service they’d provide, I still did some checking around before I booked through GET Travel. I had a good experience with them, with everything handled correctly. The only downside to this whole process was my own stress about the uncertainty since it was my first time doing this. Hopefully I’ll handle that better next time! 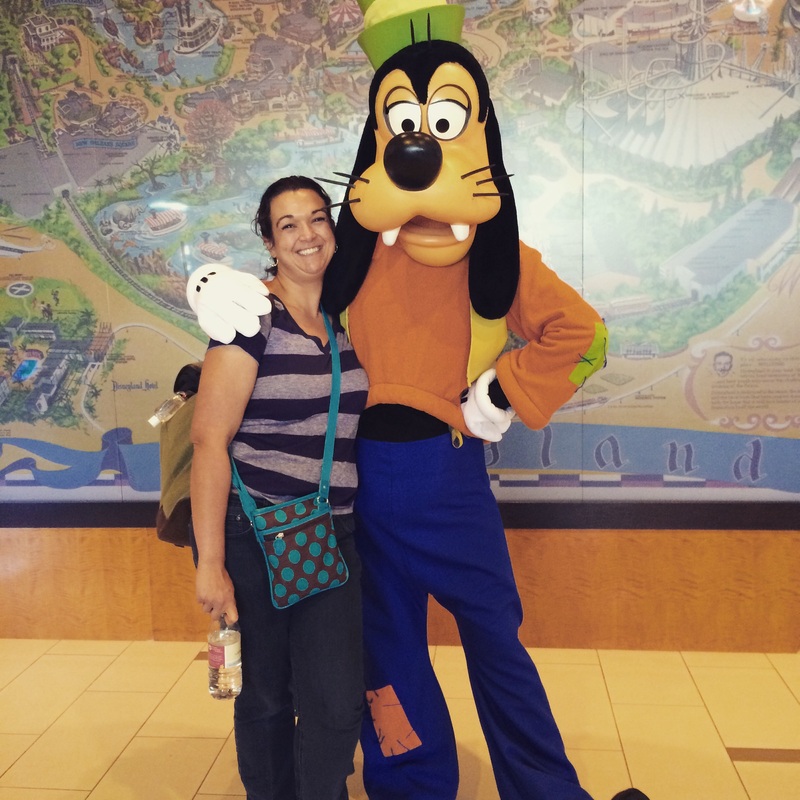 Have you ever used a travel provider to book a runDisney race? 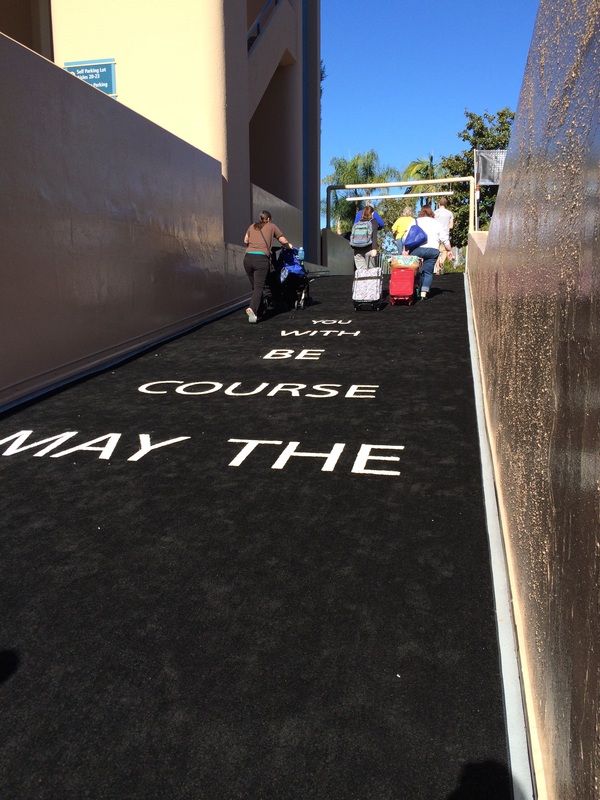 Thoughts or recommendations on travel providers for the Walt Disney World races? I’ll definitely be looking at those options for Wine and Dine when its registration comes up in March. I had an entirely different topic planned for today that’s just going to have to wait for next week because I need to talk through yesterday’s weigh in. Let’s go ahead and pull of the bandaid and get the number out: 176.5. Yes, up 3 pounds. Yes, back where I started when I made the switch to My Fitness Pal. That number stung more than I wanted it to. I’m clearly still letting the number on the scale mean a lot, but I’m making progress. – When I stepped on the scale yesterday morning for my weigh in, that was the first time I’d stepped on a scale in two weeks. That’s right, I stuck to my plan of staying off the scale immediately after Disneyland and otherwise only weighing in on my official day! That is a huge victory for me, because I’m someone who has been a daily weigher in the past. Staying off of the scale has really helped me focus on the way my body feels rather than how that number says my body is doing. – There’s part of me that wants to weigh in again on Friday because surely this 3 pounds isn’t real. In the spirit of keeping to my primary goal this year of staying in my pants size (which I am) and finding a happy balance with food and health choices, not just the scale, I think I’m going to say no to this idea and stick to my normal weigh in days. It’s true, I got flagged on My Fitness Pal for being over my daily sodium limit Saturday, Sunday and Monday before my Tuesday weigh in (restaurant soups, Chinese food) and that may have impacted the number, but I don’t want to micromanage that number. I’ll weigh in on my next weigh in day and not before. – Knowing I’d had more sodium than usual for the last few days (and we’re at that time of the month), part of me wanted to skip the weigh in all together because I knew it would be up (despite the little messages from MFP every day saying). I didn’t. I told myself it was just a piece of data and climbed up. Besides, if it’s up for salt and hormonal reasons, that means I should have a great loss next time, right? I hate this little message that pops up when you “complete” the day with MFP! I’ve done this long enough to know this isn’t linear math. – I also have to admit the possibility that this gain is real. I did just back from Disneyland, where I ate too many tiny cakes at the Wookie party. I did end up 600+ calories in the hole Saturday thanks to a lovely birthday party with lots of wine and a piece of birthday cake. If earned these pounds, that’s okay too. I just have to accept that and move forward. I can’t let one week of a gain mentally discount the previous two weeks of losses. – Right after this weigh in, which would normally get me down, I got dressed to go run. Because I’m a runner. 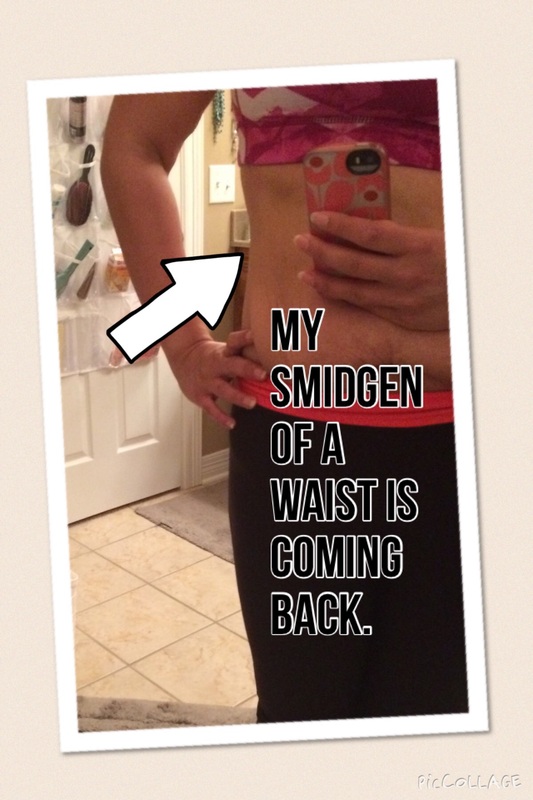 And while I was getting dressed, I noticed that this cool little divot of a waist is showing back up. I’m definitely feeling less fluffy overall since cutting my fruit consumption back (because that’s really what has changed since switching to My Fitness Pal). The way I’m eating is fueling healthy activity and showing up with cool little changes in my body, so I need to keep that number in proper perspective. This helped re-center me a lot this morning. 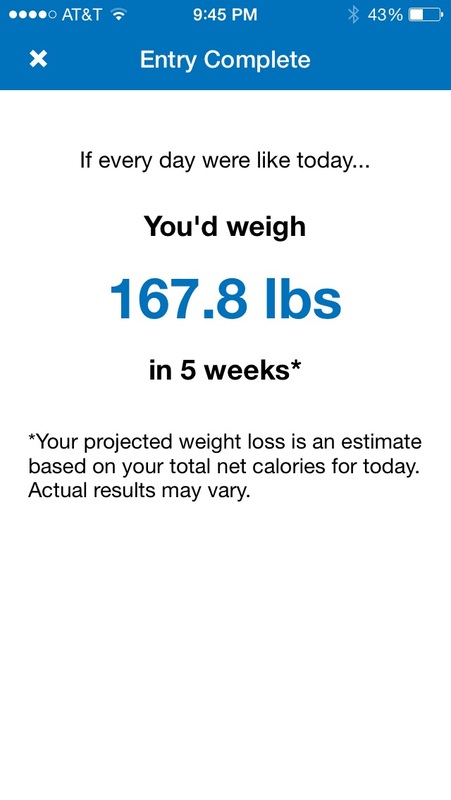 Little ups and downs like this are why I’d committed to doing My Fitness Pal for at least two months before going to back to Weight Watchers if I need to (and if I go back, it’ll be going back to a meeting because that’s what worked for me before). I hereby promise to stay off the scale until my next weigh in day and actively appreciate my healthy body. What are you doing to appreciate your body this week? As part of the package when I booked this trip through a travel provider (more on that coming Thursday), I got tickets to the Wookie Welcome Party. 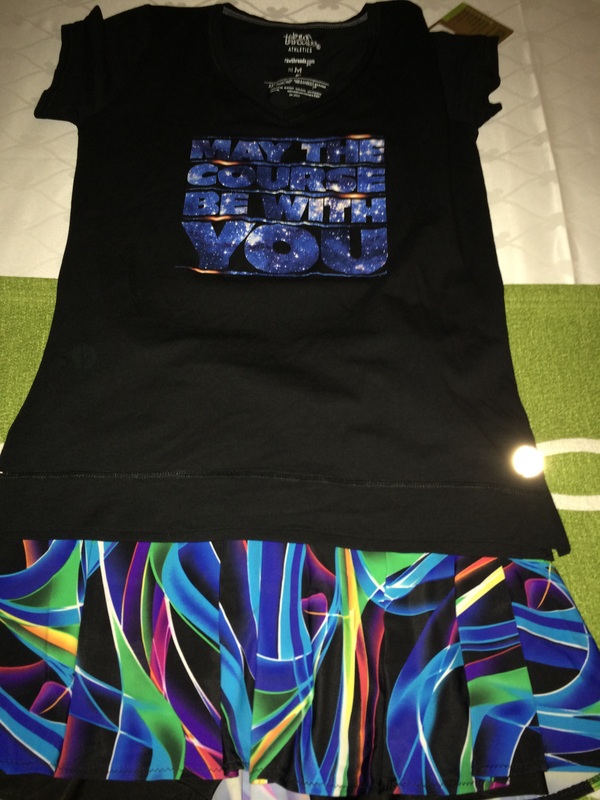 As I was there without my family, it seemed like the perfect time to try all of the RunDisney weekend offerings including this pricey ($99!) little party. Aside from the cost, the biggest downside to this event, for me, was the time. It was from 9:30-11:30 pm. Considering that I had flown in earlier that day (Thursday) from the Central Time Zone and had been up since before 4 am CST, I was beyond wiped out by the time that party rolled around. I had room service for dinner at around 7 pm and then took a little nap before the party. I was fully prepared to sleep through the alarm. Nonetheless, I woke up and headed out around 9:30. 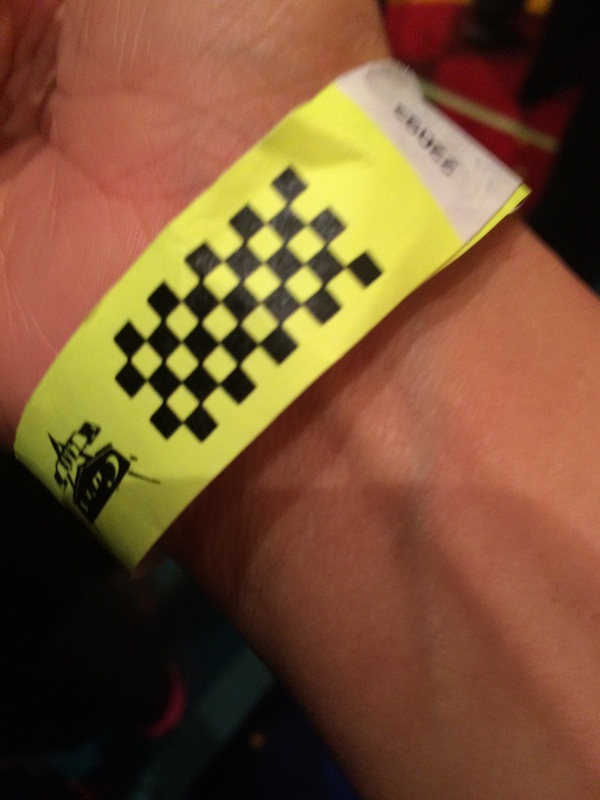 My entry ticket was a wrist band I’d picked up at the Expo earlier in the day. When I got to the entry of the park, they were just letting the long line of people in through the gates. 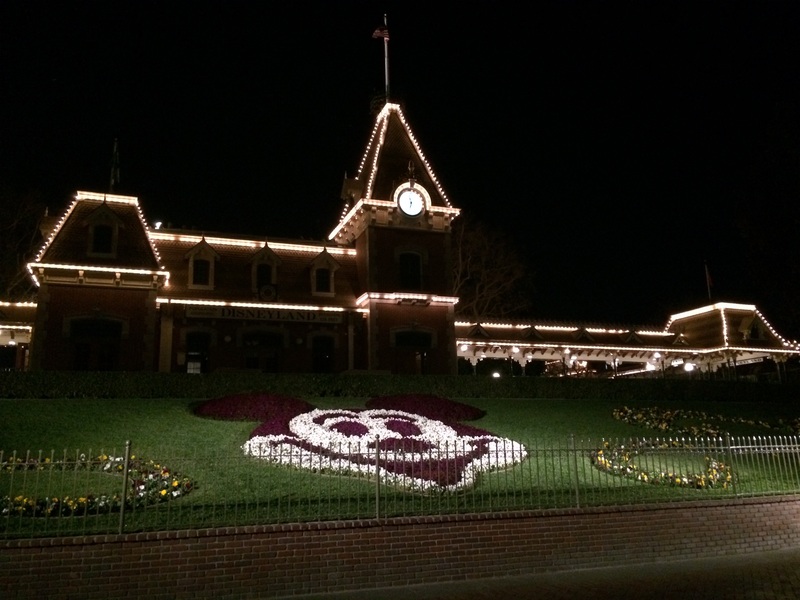 It was really interesting to see the park after dark with so few people inside. It was especially nice to see this all lit while I could take my time and soak it in. 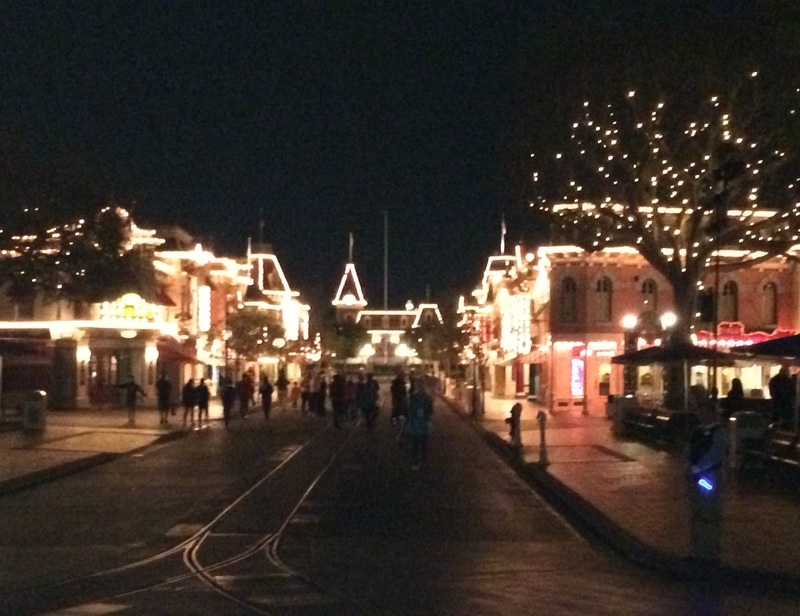 I was glad I’d seen Main Street during the day so I could appreciate it even more at night. After 5 minutes of walking around the park so empty, I was more than glad I’d gotten myself out of bed when the alarm went off. Even more empty than on race day! Very cool! 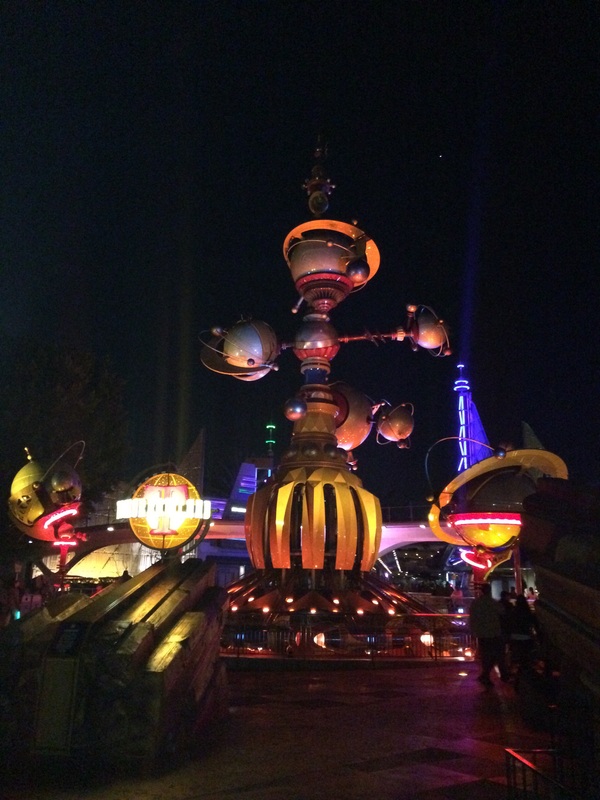 The party was over in Tomorrowland, with cast members stationed at the hub to keep the crowd moving along. By the time I got to Tomorrowland, it was only 15 minutes or so into the party and the character lines were crazy long! There was one station for R2D2 and C3PO. I got in line, but before long a cast member came along telling us that by the time we got to the photo op, the characters would have switched to Luke and Leia. I had zero interest in Luke and Leia, so I moved on. There was also a Chewie station with a huge line (common theme – Chewie was popular all weekend) and a station with Mickey and Minnie dressed as Luke and Leia, which was super cute. 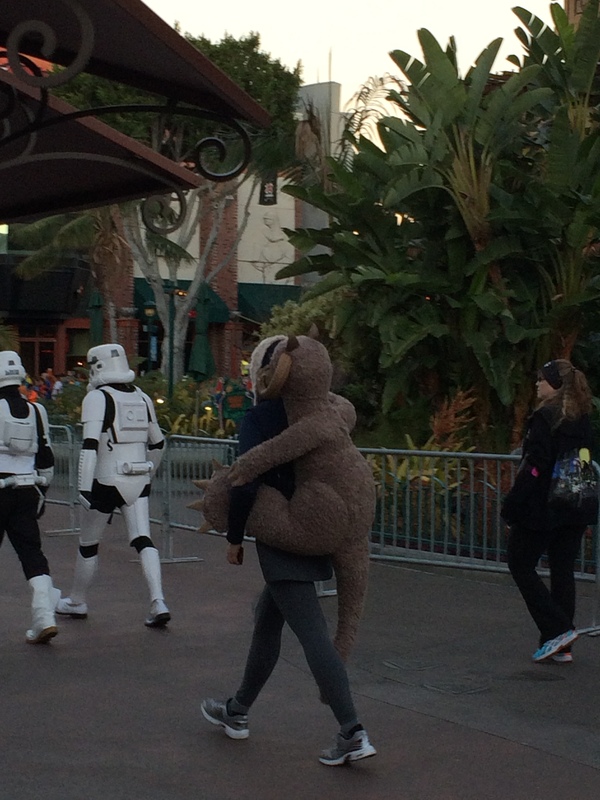 They kept Chewie out all evening – I wonder how hot that suit gets? 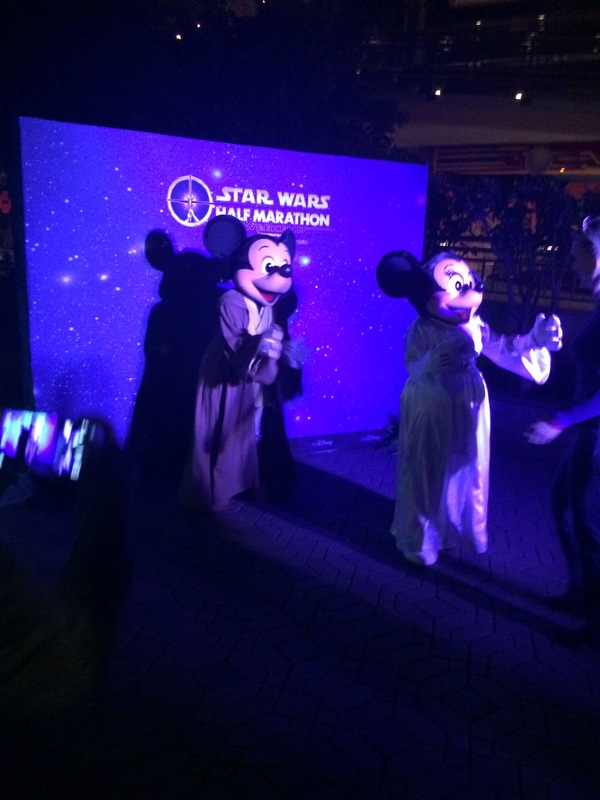 Mickey and Minnie were much more photoworthy than the human Luke and Leia. I popped over to a snack table to get some food for the wait and settled in to wait for Mickey and Minnie. Before long, they swapped out Mickey and Minnie for Goofy and Donald, which was even better! 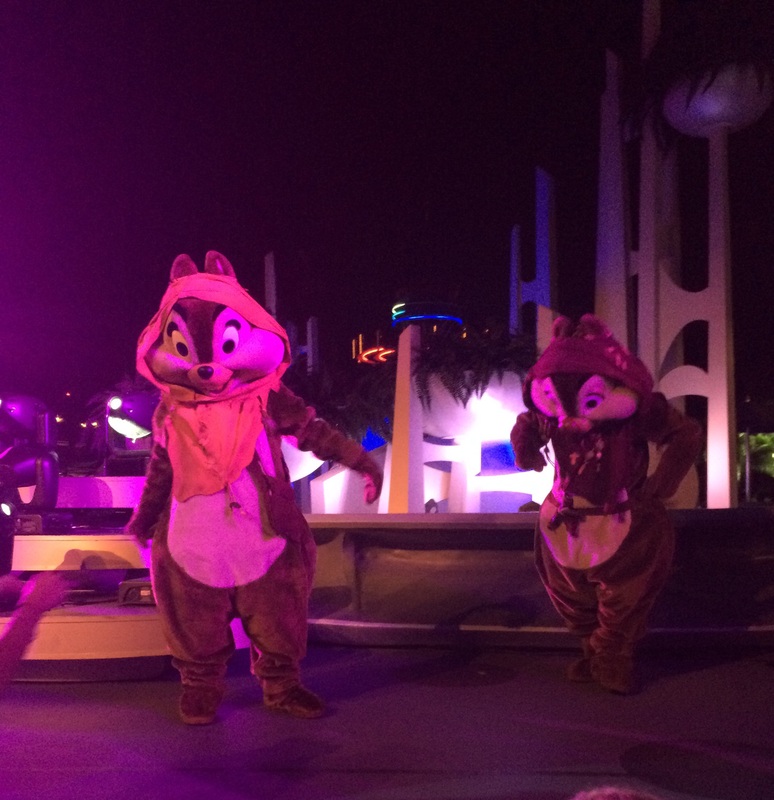 We were stationed next to the stage with the band and super-cute Chip and Dale dressed as Ewoks. The music wasn’t bad and watching the Disney characters was even better, so the time in line went quickly. 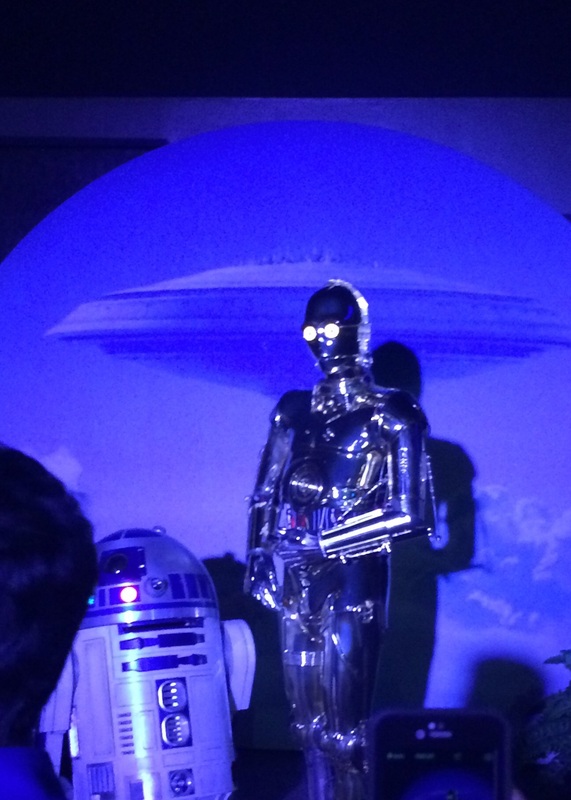 Darth Vader also made a grand entrance on the stage after Chip & Dale. 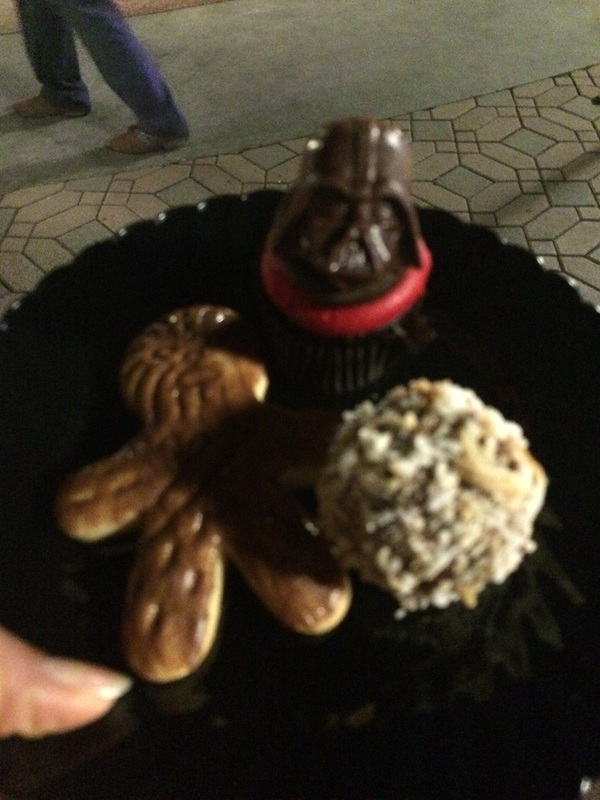 The wookie cookie was cuter than it was tasty, but the rum ball was really good as was the chocolate cupcake with the solid chocolate Darth Vader. The time passed quickly chatting with others in line (that’s when I met Elsa Fett, featured in Friday’s Favorite Costumes last week) and before I knew it, I was up dancing with Goofy and Donald. It was a fun little moment, but I was done with waiting in line by then. To be fair, it was after 10:30 and they were near closing the lines (still really long!) so that everyone would get out by 11:30 when the party ended. I decided to go check out the rides that were open, which was a great idea because there was ZERO waiting in line for them. 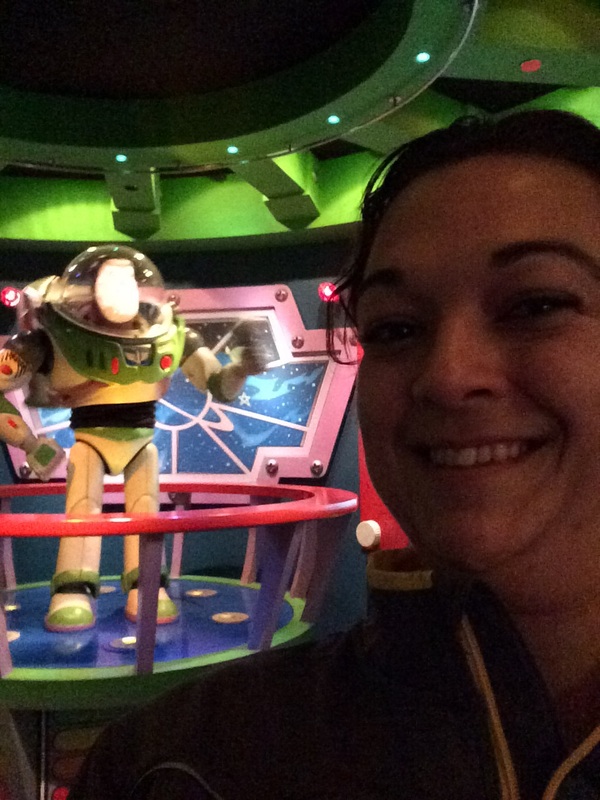 I got to ride a mostly empty Space Mountain, Buzz Lightyear (which broke down at night just like it always does during the day), Star Tours and AstroOrbiter. Riding things in the empty park was a lot of fun. Isn’t it beautiful at night? Not a bad score right? This one works a lot better than Walt Disney World! Disneyland’s Space Mountain is definitely better than WDW, especially at night and empty! By the time I finished all of this riding, it was time for one more round of cupcakes and rum balls (I definitely overdid it with those) before heading out of the park. Even if it is small, it’s still gorgeous. One thing to be aware of – you definitely want to get to the party at the start time, or close to it, if you want pics with characters. They close the lines early so they can get everyone out on time. One mom and her son I heard complaining didn’t arrive until after 10:30 and all of the character lines were already closed by then, which was unfortunate. I’m glad I went early. Another thing that worked out well for me was wearing my compression socks. My legs were already tired from the Expo and park that day, so the extra support when I headed back to this late night party was a life saver in terms of keeping my legs fresh through the weekend. While this was fun, it really wasn’t worth $99 for me. You only have two hours to eat tiny desserts, ride a handful of rides and/or wait in line for character photos and for me, at least, that isn’t worth $50 an hour. I’m glad I tried it once, but I don’t foresee doing it again. Has anyone else done one of these pre-race parties? Worth it for you or not? 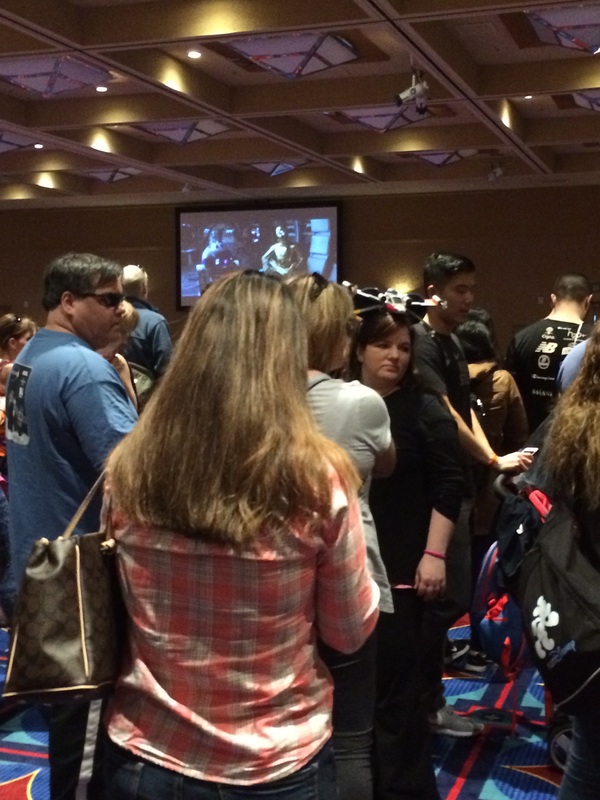 The ballroom was full of people in line waiting for race merchandise. 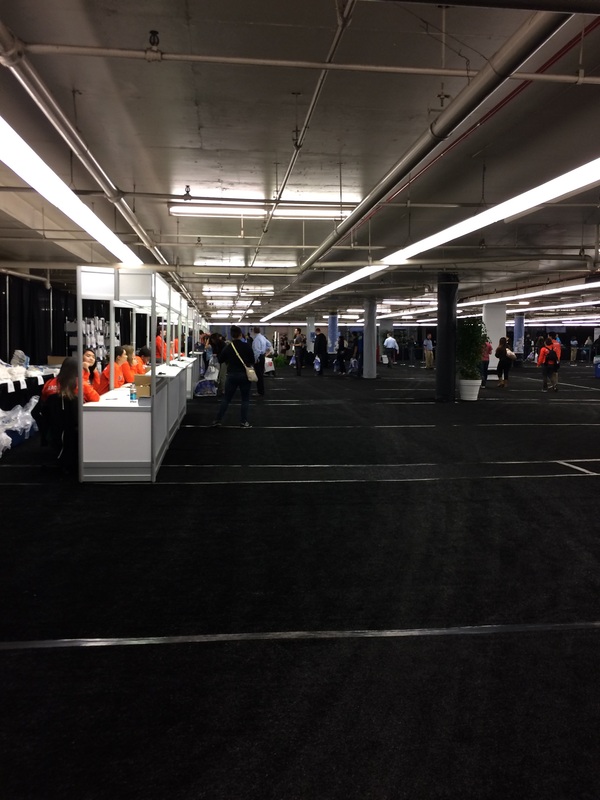 This was the first holding area, before we sent a SECOND holding area, before actually entering the line for the race merchandise area. It was crazy! On the plus side, in this particular ballroom, they were playing the Star Wars movies on a screen in front to keep us distracted. The yellow people had to stay between the red lines. Looking down on the second holding area for the official merchandise line. We spent another 30 minutes here (without the movies to distract us – boo!) before finally heading up to the race merchandise area. While it was a lot of waiting in line to start off the morning, I will say that once we got into the official merchandise area, things weren’t crowded at all. I felt like I had plenty of time and space to look at everything, which was great. 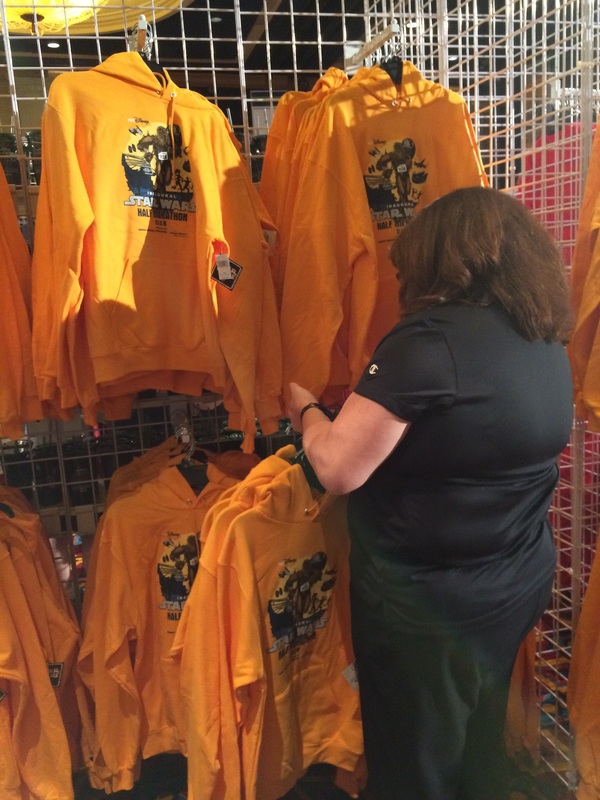 They were restocking as we were in there, but I heard at least one shirt that they were already out of in small less than 1.5 hours into the Expo! Restocking throughout the day, which was great, and lots of helpful people for questions. I got the super cute “Let the Wookie Win” shirt, which is love sleeved with a hood, and a great jacket (men’s cut I think) that is thick enough to get lots of use with chilly Nebraska runs. I like the reflective stripe on the jacket too. O is excited about the medal. 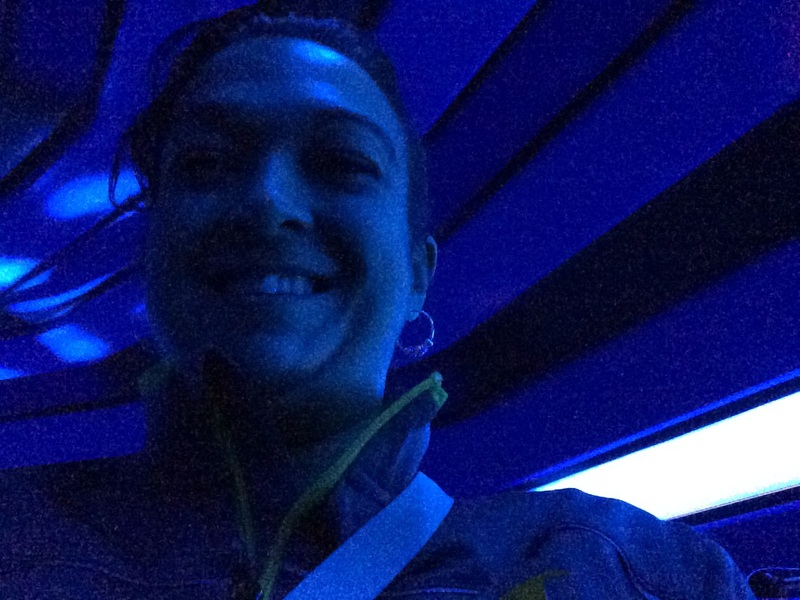 Checkout was quick and easy – there are always lots of people at Disney willing to take your money in my experience. 🙂 After that, I headed back outside to the separate entrance for packet pick up. I’m glad I decided to hit the official merchandise before packet pick up because there was absolutely NO line for packet pick up by the time I got down there. Lots of empty booths waiting to help people. It took no time at all to go get my bib and bag. Definitely print out your waiver ahead of time – it helps speed things along! I then had to stop at a photo stop to get my photo challenge for the Rebel Challenge (doing this instead of arm bands now). The stations for picking up park tickets from the travel provider and arm bands for the Wookie Welcome party were also down here. After gathering all of these, it was time to head back out to the main Expo space to get my race shirts (slightly irritating that Disney separates these, especially if you wanted a quick in and out). A great way to start a journey, right? Love the Yoda side of the medal. The Expo was so pleasantly uncrowded! 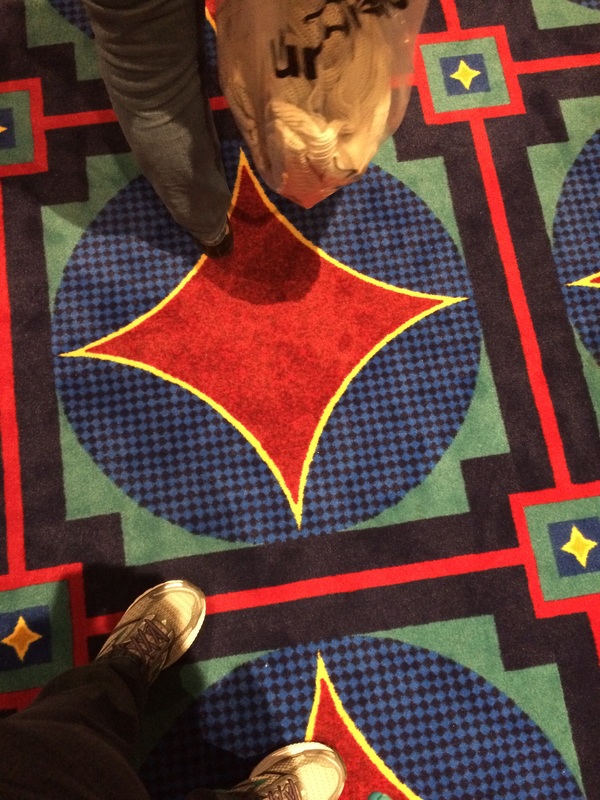 I felt like there was plenty of space to walk between the booths. Shirt pick up was quick and easy, and exchanges are in the same space if you need them. 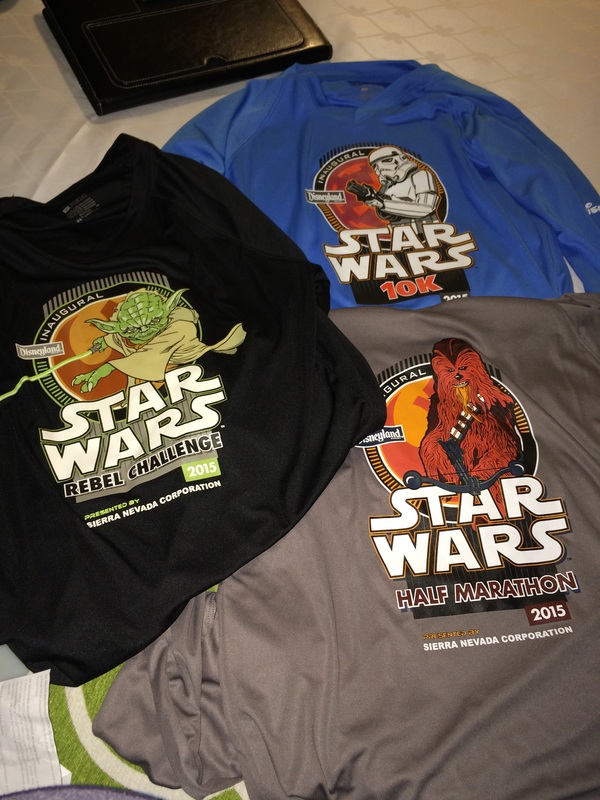 I like all 3 shirts (long sleeved, v neck tech fabric) but the Yoda is definitely my favorite. 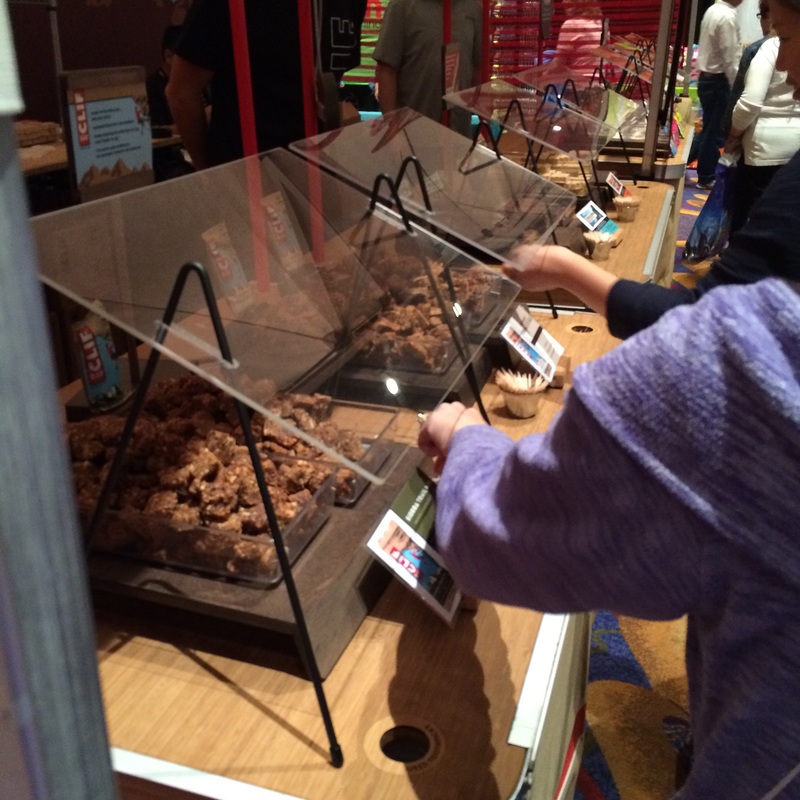 I love that you can order it online and pick it up at the expo – less packing and less in shipping. Then it was time to wander and look at things. 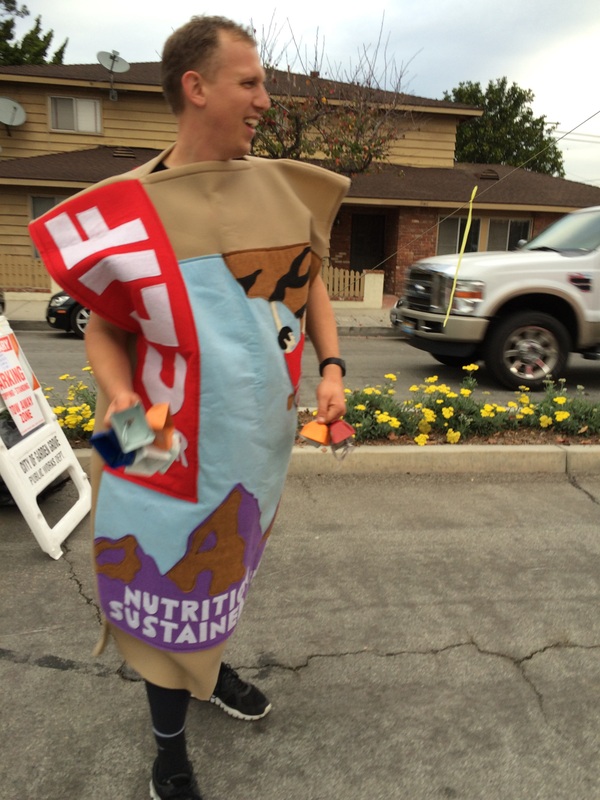 I tried out the Clif Bar tasting station, which was much needed since I hadn’t had lunch yet! Like a little Clif salad bar. 🙂 They also had it set up so you could taste the gel flavors that would be on the course at mile 8, which I thought was a great idea. 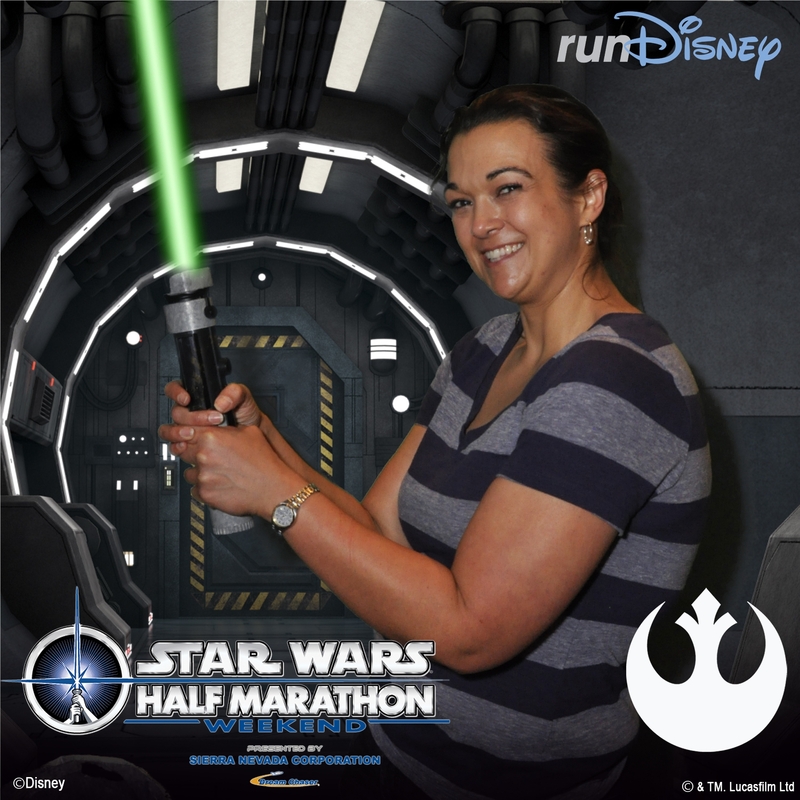 I love the RunDisney Instagram booth. 🙂 I have to say, I like this picture of me! Not as awkward as my normal posing. They had lots of vendors with running supplies, cute running shirts (lots with specific Star Wars theming), RunDisney medals for other races and all the usual fun things. Thanks to lack of crowds, I was able to get through the Expo itself quickly and get out for some much needed lunch before hitting the parks. 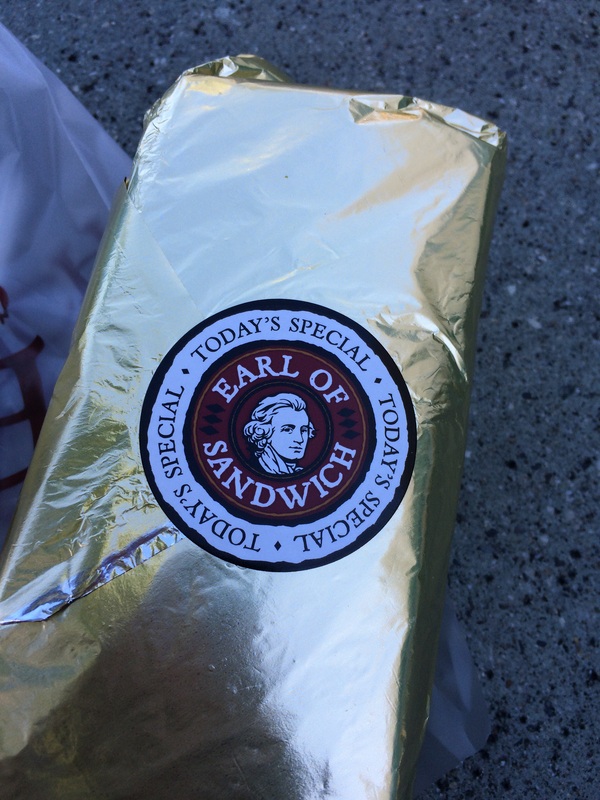 Earl of Sandwich Holiday sandwich – just as good as I’d heard! I confess I was a little nervous about the Expo, given all I heard about the chaos of prior Disneyland expos, but this went really smoothly. Disney definitely pays attention and makes adjustments based on prior experiences and they’ve clearly learned how to keep this kind of expo experience reasonably well controlled. I really wish they’d offer more pre-order of race specific merchandise with registration, so you didn’t have to worry about all of the lines and things selling out, but hopefully they’ll introduce more of that. I didn’t stay this time for any of the speaker series (wanted to put that park ticket to use!) but really enjoyed the ones I attended at Princess weekend so I’d definitely recommend checking those out if you get a chance. 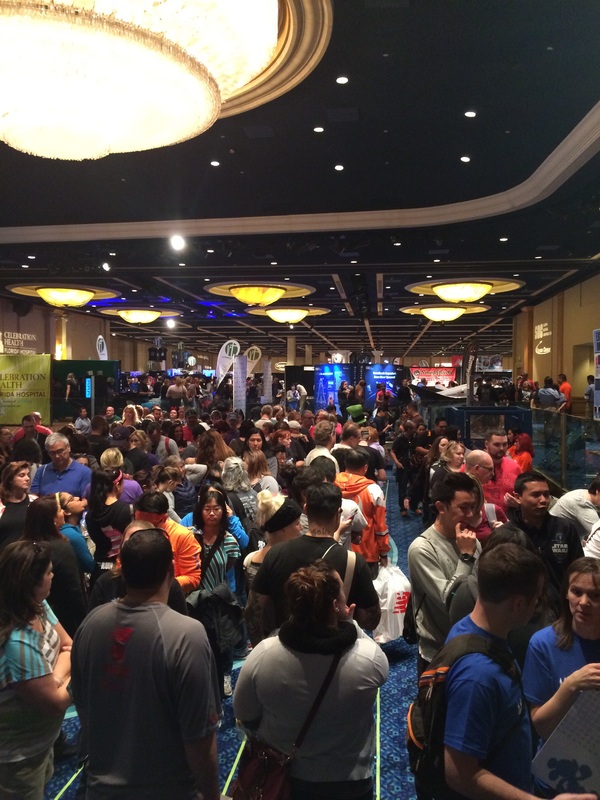 Do you plan for shopping at the Expo when you’re setting up a race budget? It’s easy to spend a ton in a short amount of time with all of the cool goodies they have! Technically, this week is 15 weeks out from the Lincoln Half Marathon and therefore the start of my new training plan. Of course, I had to balance that with recovering from the Rebel Challenge. Monday Rest and settling back in. Unpacking and taking care of all of the mom/wife stuff at home meant I had lots of steps for the day but I didn’t really get an official workout in (unless you count laughing as I fed the ducks with O). 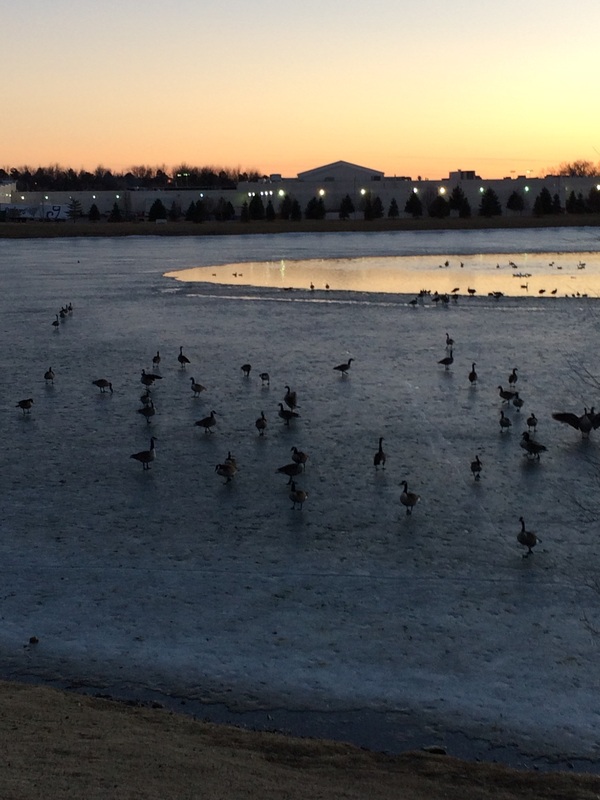 Watching the geese sneak around behind Oliver and startle him was really funny. 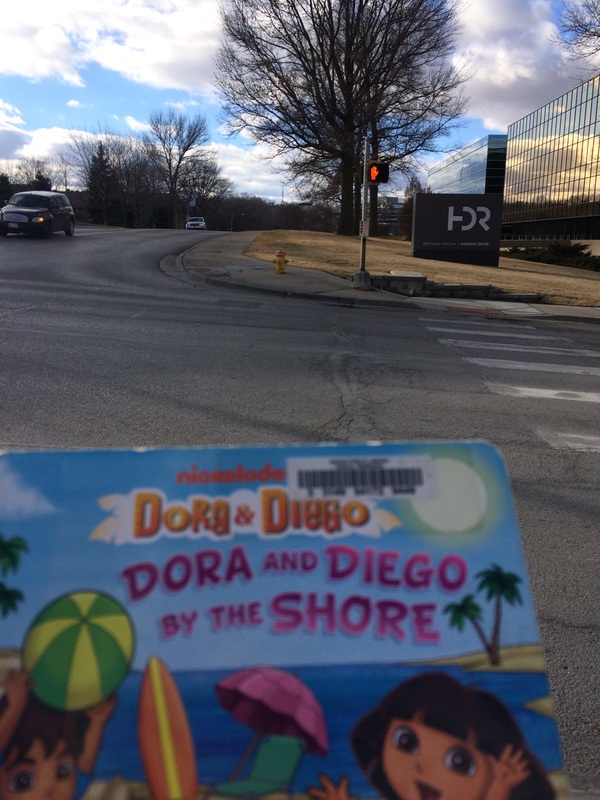 Tuesday I decided to ease back into things with a 30 minute walk to the library to return Oliver’s long overdue Dora the Explorer book. 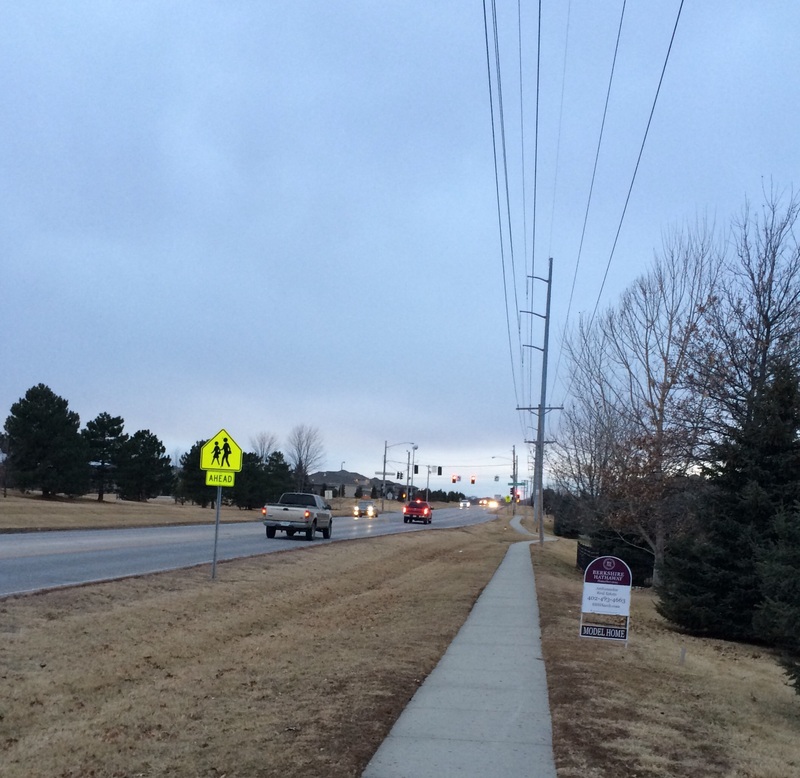 It was chillier than I was expecting and a stepper hill than I remembered, but it felt good to move a bit again. Thanks to my efforts in recovery for the back to back runs, my legs already felt back to normal. Thank goodness there aren’t late fees on the kid books! Wednesday 50 minutes of walking and 10K steps for the day! I did some pacing in the house to get to 10K. Thursday I got out for a late night run around the neighborhood. It was only twenty minutes, but it felt good to loosen things up again and see where any tight spots lingered. 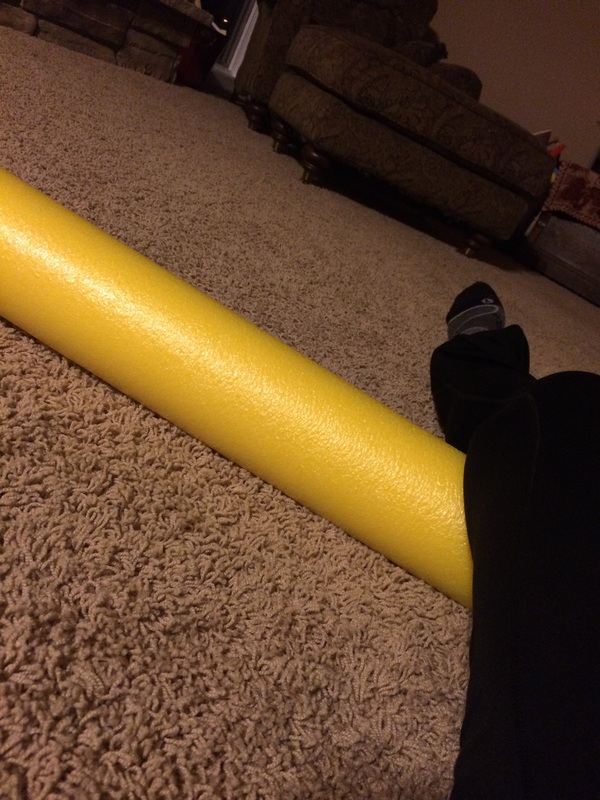 I had a very painful foam rolling session after I got back in but my left leg felt MUCH better afterwards. I can honestly say it was the most painful foam rolling session I’ve ever had but boy did it make a big difference! Friday Rest day, thanks to a measles outbreak in town throwing everything into a tizzy. Saturday The long run for the first week of my training plan is 5-6 miles, which seemed doable a week out from the Rebel Challenge. My plan was to take it slow and easy, with lots of walk breaks, but cover the miles. It was in the 50s and occasionally spitting rain, but I headed out with a plan to do 45 second run/30 second walk intervals, which I did until the last mile. The last mile is essentially all uphill, so I walked a little more for that mile and ended up with 5.25 miles at 12:25 pace. My legs felt heavy still, but no pain anywhere. I right before we headed out to a dinner party, so I didn’t get to do any foam rolling but I will today to help things stay in good shape for next week’s runs. Along this stretch, I could smell the fried chicken from the grocery store half a mile away thanks to wind. Definitely a little odd when you’re running! Sunday A rest day per the training plan, but today is Katie’s birthday and she’s doing her Runs for Cookies virtual 5K so I have to get out there for Katie. I can’t resist the warmer weather, knowing we’ll be back in the frigid temps again in February. Check out Katie’s site and run with her today. She’s been a huge inspiration for me! I’ll mostly walk these miles, I suspect, but at least it will get me to 10K steps today. I won’t get 70,000 this week, but hopefully I’ll get close. Looking back at this recap of the week, I also notice there’s no strength training anywhere on here so I need to get in some of that today as well (good thing I do this little exercise of looking back on the week!). I feel like I’ve done a good job getting back to healthy, non-vacation eating since I returned home, with a focus on vegetables and lots of water, so that’s my NSV for the week. My good deed this week has been coming in to help answer phone calls in the office to ease the burden a bit for the rest of my team, rather than hiding in my other office to get my own work done. We live in interesting times, with all of the vaccine-preventable diseases that we thought we’d eradicated rearing their ugly little heads again. I’m definitely grateful for modern healthcare and knowing my little guy is protected from things that were devastating for children just a generation or two ago. The doctor was hard at work yesterday. 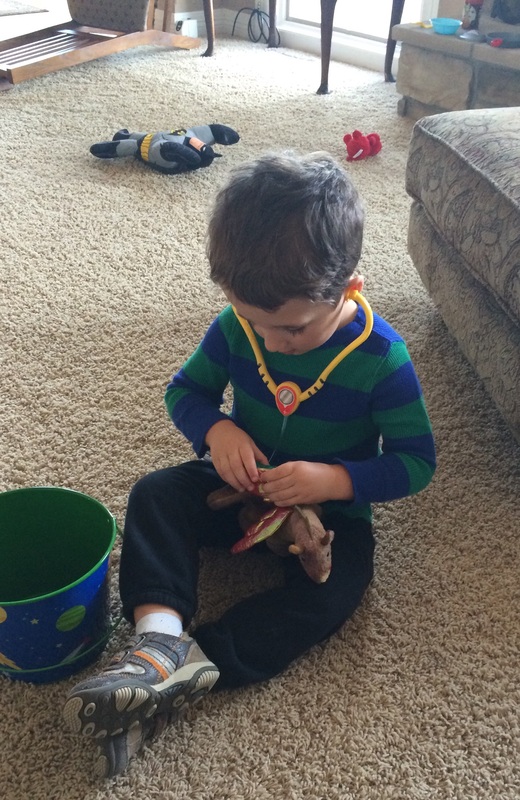 All of our stuffed animals had gotten very sick and needed a hospital. I felt like there was a ton of character interaction in the parks! For this Friday Favorites, I wanted to highlight some of the fantastic costumes at the Star Wars race weekend. 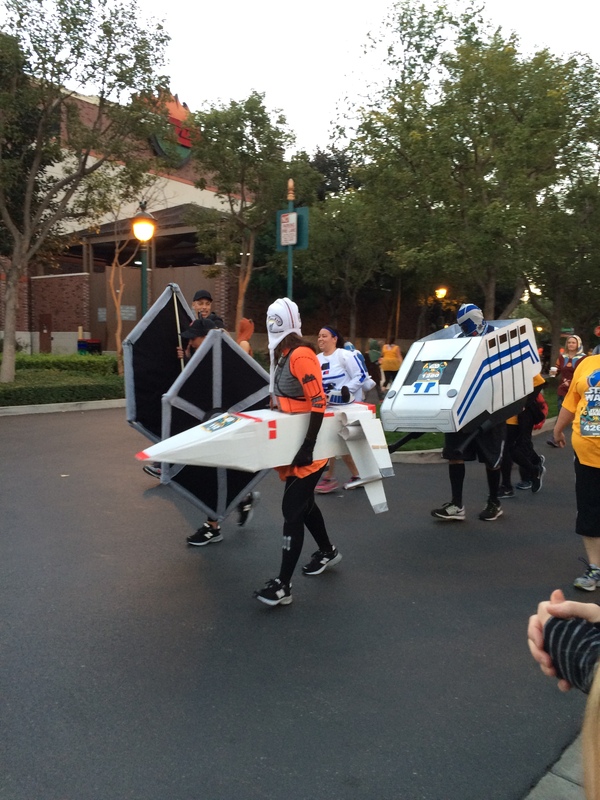 As a non-crafty person myself, I am in awe of the creativity of these costumes and the fact that people can run in them! 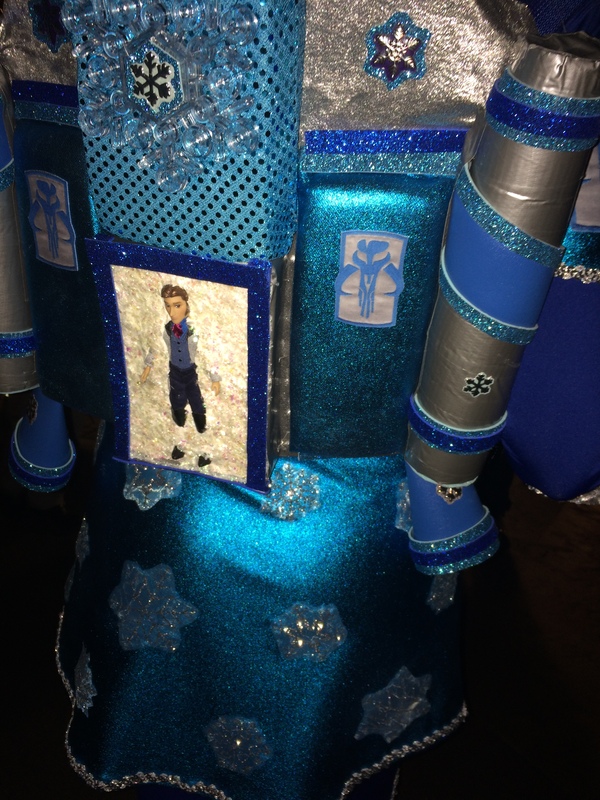 For better pictures of some of the costumes, check out this Buzzfeed post. 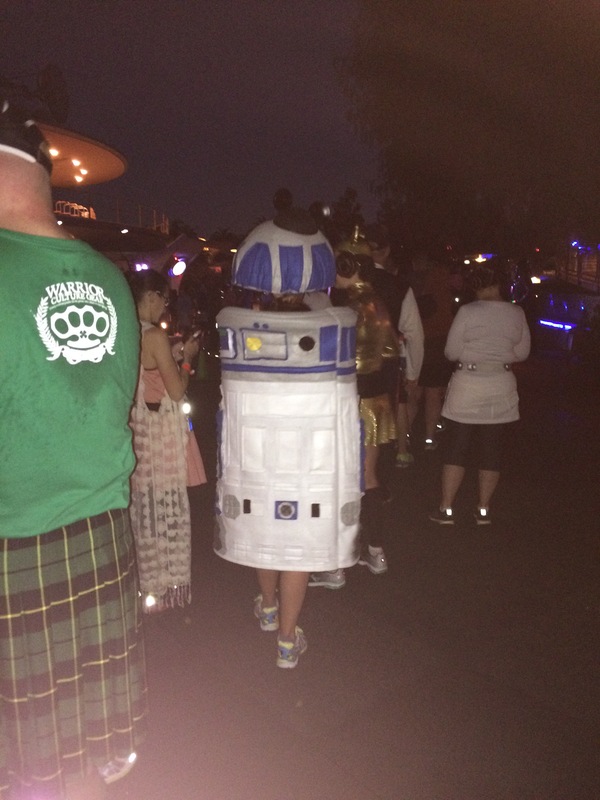 R2D2 for the 10K – she ran 6 miles in this! On a more serious note, my best thoughts and mental hugs go out to Peggy Sue’s family. Anybody who has run a Disney race has likely seen Peggy Sue cheering us on with her awesome sign (Hello Complete Stranger, I’m Proud of You Too). I had heard about Peggy Sue before I ran the Princess Half Marathon and remember how near tears I was when I saw her, both because that meant I was almost finished with this huge thing of running my first half marathon, and because it was just such an awesome act of humanity for her to be out there sending out such palpable joy and good will to all of the runners. There is a lovely message from her family here on the Peggy Sue Facebook page. I hope we can all learn from example and cheer each other along in life, no matter what kind of race we’re running. Thank you, Peggy Sue. I hope you all have a great weekend! I’m planning on hitting the streets for my first real run since the half marathon (5-6 miles on the plan), so here’s hoping for good weather! One of the things I was most worried about was the idea of running races two days in a row. My training plan was set up to practice putting all of those miles on my feet, but I was a little worried about how it would play out in the real world. 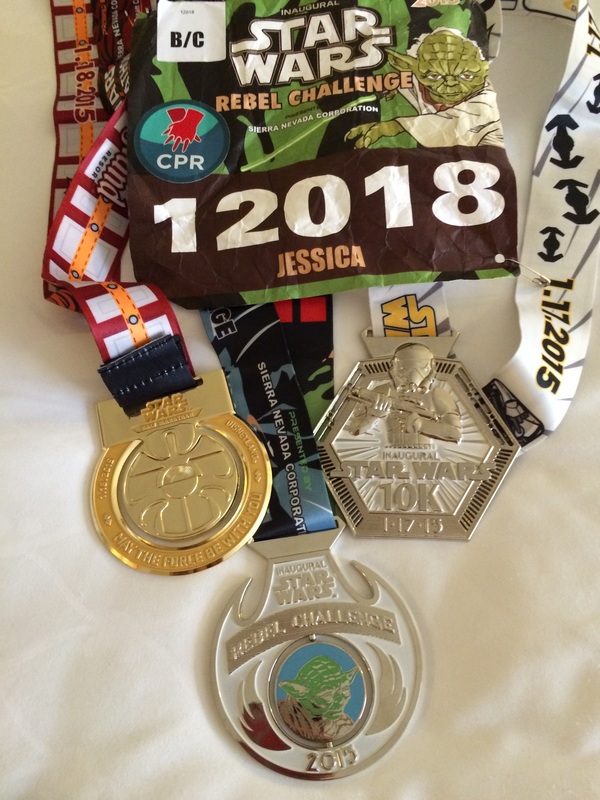 I know some of you are doing the Glass Slipper Challenge next month, which will also include a 10K and a half marathon, so I thought I’d run through some of the things that I did well and some I did not so well for the Rebel Challenge. 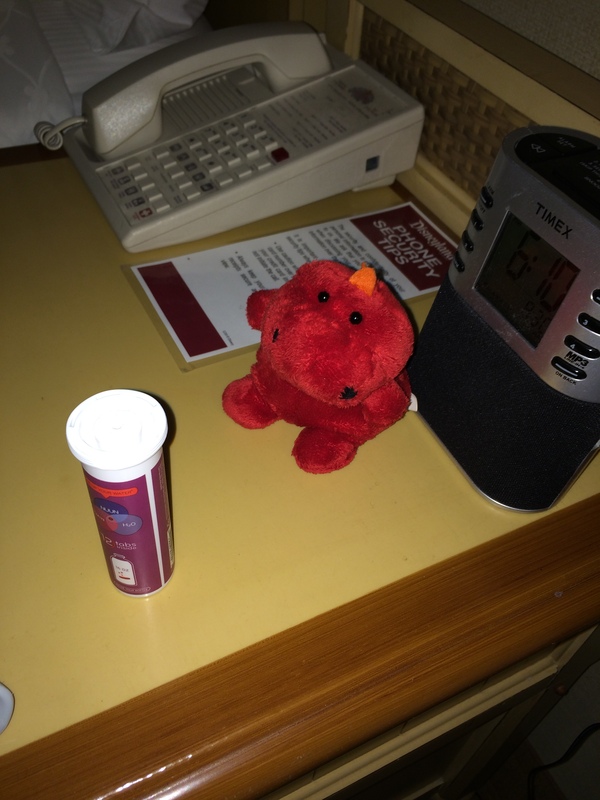 Oliver sent his dinosaur (also named Oliver) to help me get to sleep at night. How could I resist an opportunity to get pictures like this? – Good: Great hydration! I drank water with Nuun throughout the day all 4 days in California, which is key for me because I’m a super salty sweater (I was crusty after the half!). 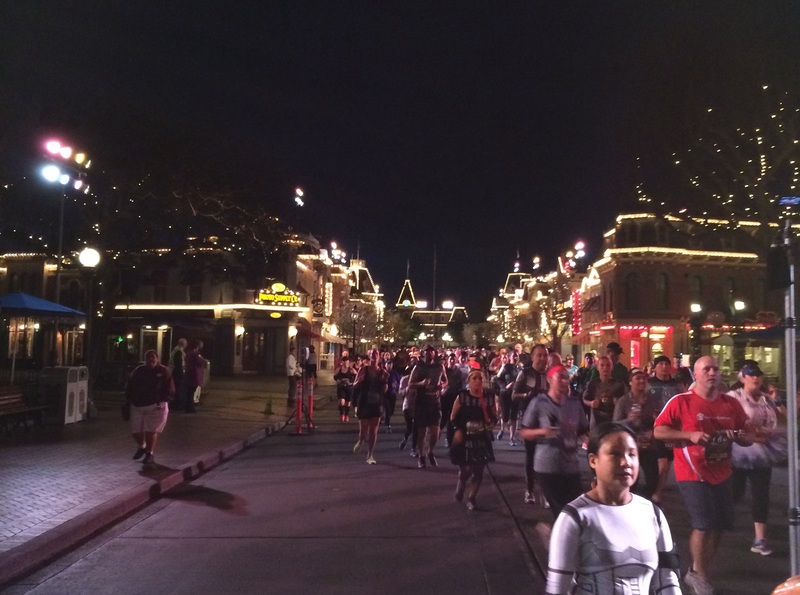 It’s so much better to go into the races with your cells all tanked up rather than trying to play catch up, especially since it’s so easy to get caught up in the hoopla of a Disney race and forget things like drinking and fueling on the run. Speaking of which . . .
– Bad: Not fueling on the run like I’d planned. Everything I’d read about back to back races like this warned that you’d need to be more aggressive about fueling on the run to be sure you didn’t exhaust your glycogen stores by tapping them two days in a row. I got so distracted and was having so much fun that I definitely do this like I’d practicing, using nothing in the 10K and two gels in the half marathon (less than I use for a half marathon that isn’t back to back!). This didn’t seem to throw me off too much, thankfully, but I think that’s because I was really good about POST race fueling. – Good: Focusing post race fuel on carbohydrates and protein to recover! I’m not always great about refueling immediately after a run because I’m usually not hungry at that point (a few hours later, starving to death, but not in that immediate window of optimal recovery). This time, being cognizant of the fact that I hadn’t used my gels like I’d planned, I was sure to immediately eat that hard-earned banana, drink the Powerade and eat the LaraBar in the little RunDisney food box we got after the race. I think that, along with good food choices throughout the rest of the day, saved me from this particular mistake. – Bad: Trying something new between races. As much as you feel like you’ve earned it, save your treat for AFTER the back to back races, not between them, especially if it is something you don’t normally eat. I’m not sure why I thought it would be okay for a lactose intolerant girl who hasn’t had ice cream in a couple of years to try it in the middle of a back-to-back race challenge. – Good: Support your legs between races. I actually wore my compression socks after my park days Thursday and Friday, as well as between the races, which was a huge help given all of the park walking I did. I also had my travel yoga mat and Stick and made sure to stretch and roll things out each night, as well as some time in the bath after Saturday’s race (a warm bath in the evening to loosen things up, not an ice bath immediately after even though I know some are brave enough for that!). These were hard working legs over the weekend! Also today, we have a winner of our Southern Living Super Fast Southern cookbook. The random number generator chose comment number 7, so Farrah, email me at littlemoreeachday@gmail.com with your mailing address and I’ll have the publisher get the book out to you. What are your tips for back to back race challenges? 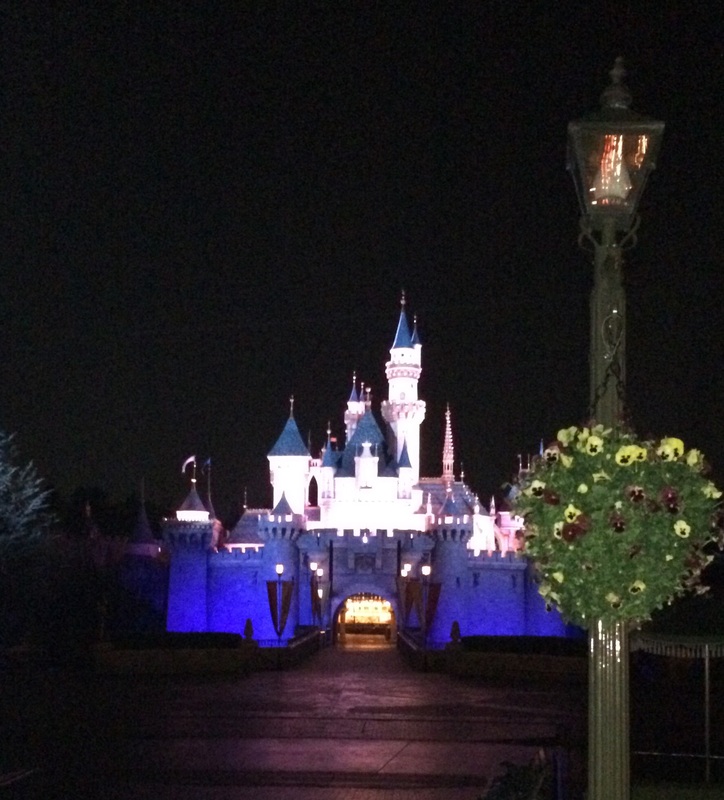 Weight Loss Wednesday: Disneyland food successes! I’m excited to say that I came out of this half marathon weekend feeling a lot better than I did my Des Moines half marathon weekend, in terms of food choices. I told myself over and over through the weekend, with all of the travel, park time and running, that my goal for the year was to make peace with food and I’m happy to say that I was (mostly) successful in that goal. – I focused on quality of food and drink in terms of fueling my activity, more than eating things just because I was “on vacation.” That meant getting lots of water instead of soda and still getting my veggies in. I ate more carbs than usual, but it was a conscious decision in terms of optimizing glycogen stores for the back to back races. I had “all you can eat” buffets in the hotel restaurant for dinner before both races and didn’t feel the need to “get my money’s worth,” which is so hard to resist sometimes. 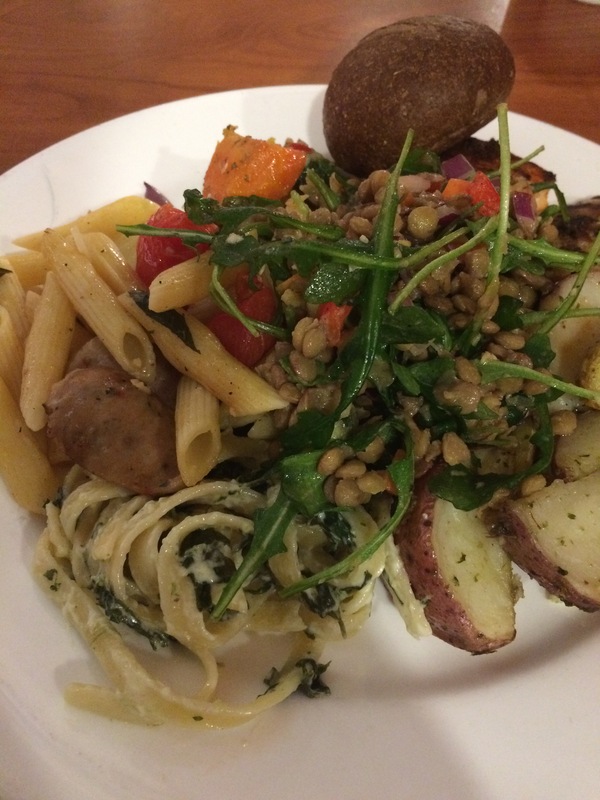 Instead, I focused on what would be good fuel for running and not upset my system too much. All in all, I really felt good about my perspective on food all weekend. My dinner Friday & Saturday before the races. – I had some carefully considered “treats”, like trying out the jambalaya at Blue Bayou which I’d heard was great (meh), my beloved Dole Whip and having bread with some of my meals. Of course, not all of the treats worked out so well. I made the ill-advised decision to treat myself to some ice cream at the Ghiradelli shop in California Adventure. It was delicious and I’m sure totally fine from a calorie perspective, given the 10K I’d run earlier in the dark and all the park walking I did afterward, but I learned that 2 Lactaid are not enough to counter ice cream at this stage in my lactose intolerance. 😦 Thankfully my stomach settled back down before the half marathon on Sunday! 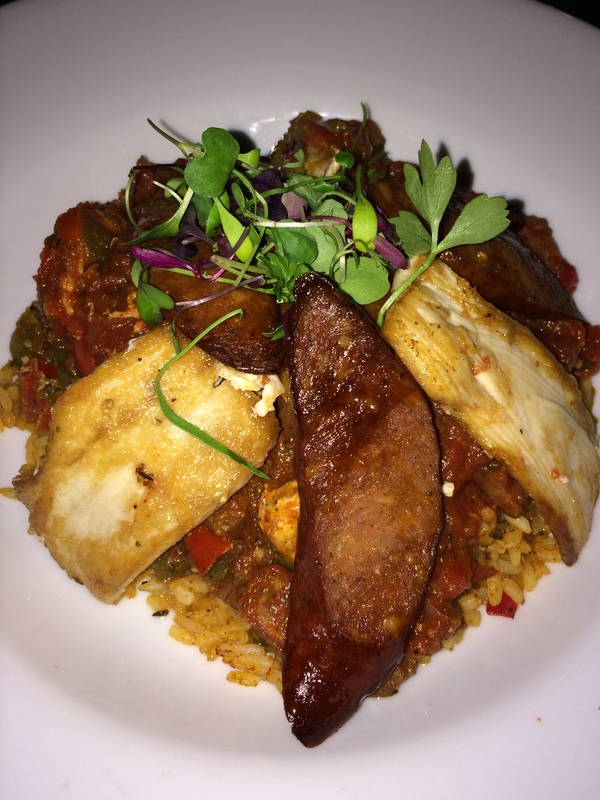 The waitress warned me that the jambalaya was spicy – it was not. Mine is way better. Blue Bayou does have good coffee. 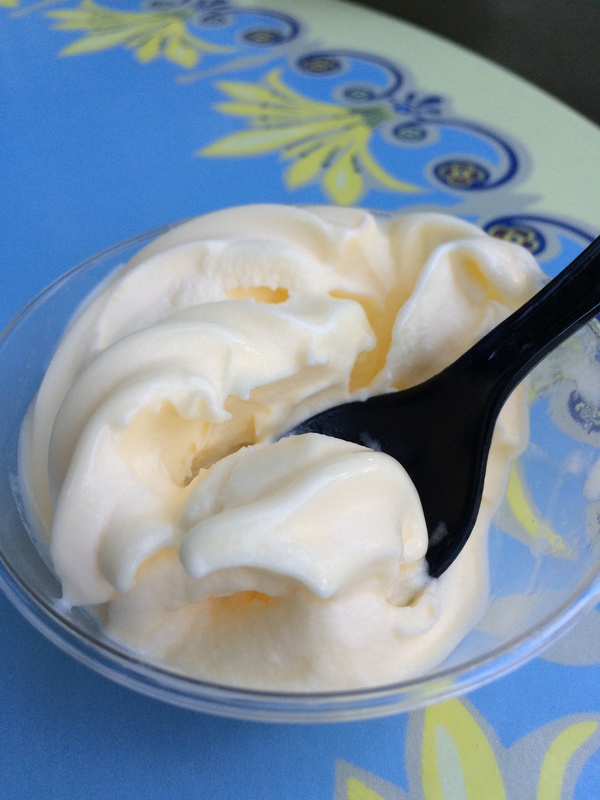 – I’m particularly proud of the first time I passed up the Dole Whip stand in Adventureland! I really wanted to stop and have one just because I love them, but reminded myself that I’d just had lunch, I wasn’t hungry and I had all weekend to come back to get one when I was actually hungry for a snack. If you know how good the Dole Whip is, you know what a huge victory that was! I also got fries with my grilled chicken sandwich in the Phoenix airport (the only thing I could find that I could carry on the plane – frustratingly few food options at 7:30 in that section of the airport!) and only at 7-8 fries. I actually threw away french fries. Crazy. Dole Whip, oh how I love thee! Those little balls were delicious! The wookie cookies were cuter than they were tasty. Overall, though, I’m really happy with the choices I made and the balance I struck between indulgences and quality choices. Hopefully I can feel just as successful about the cruise we take later this year. I’ve also stuck with my goal of NOT stepping on the scale this week, which is surprisingly hard. However, I put on my size 6 pants today and they still fit, so I know I’m keeping in my primary weight goal for the year. My only regret is not trying a churro. I’ve never had one and they were all over the place in Disneyland. What is your favorite vacation indulgence? 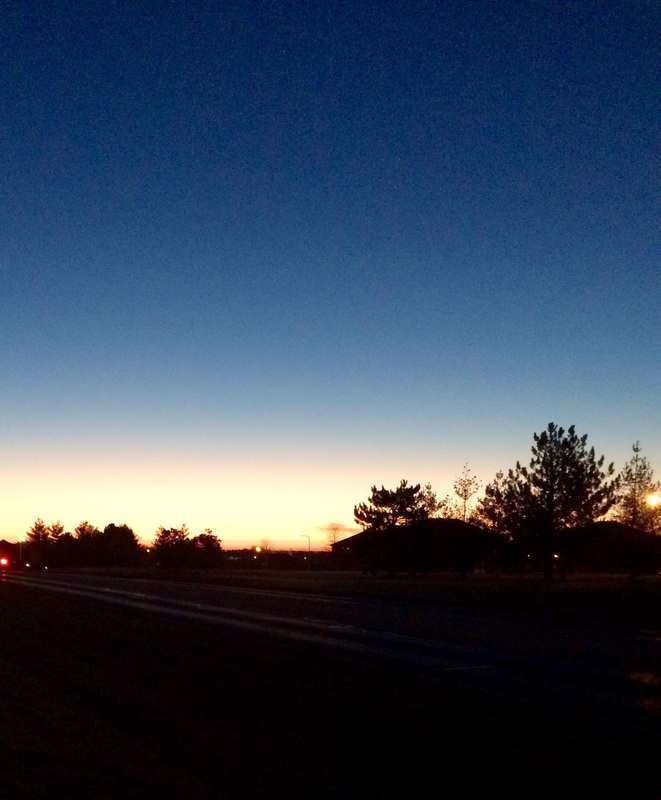 Sunday felt very much like deja vu, as I woke at 4:30 am to head down for the start of the half marathon. I felt a little stiff, but otherwise surprisingly good considering the 10K and all the park time I put in on Saturday. Compression socks are a great thing! The wait for the elevator was way too long for my tastes, so I made the brave decision to head down the stairs from the 5th floor. Brave because a) I’m clumsy on a good day, so tired legs and early mornings on all of those stairs risked disaster and b) my poor muscles may have protested all of that. Thankfully, I got safely and relatively painlessly down the stairs. 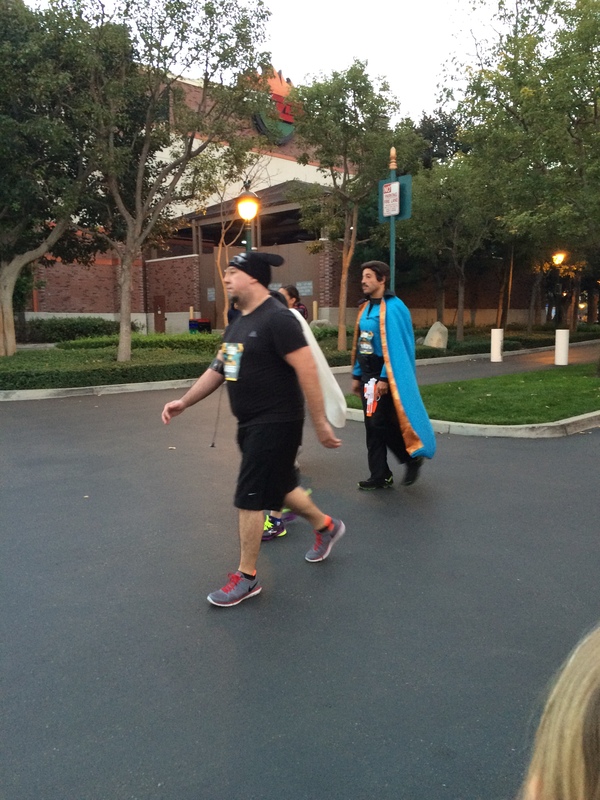 The kick-off to the race was pretty much identical to the 10K, but still fun. I’ll confess that those first two miles, which were streets around the park and backstage areas, were fairly miserable. My shins hurt, which is really odd for me. I never get shin splints. I was wearing my newer shoes, but they’d been run in plenty and weren’t the ones I’d worn for the 10K and park time Saturday. I started to worry that I was going to hurt myself. My sister had swelling in her shins enough to cause anterior compartment syndrome and nerve damage after a charity walk and suddenly I was worried that the same thing was happening to me (overreacting a bit to shin splints? Maybe). I reminded myself that a) lots of people do these challenges – it doesn’t require superhuman athleticism and b) I’d specifically trained for this back to back running, so I was going to be fine. 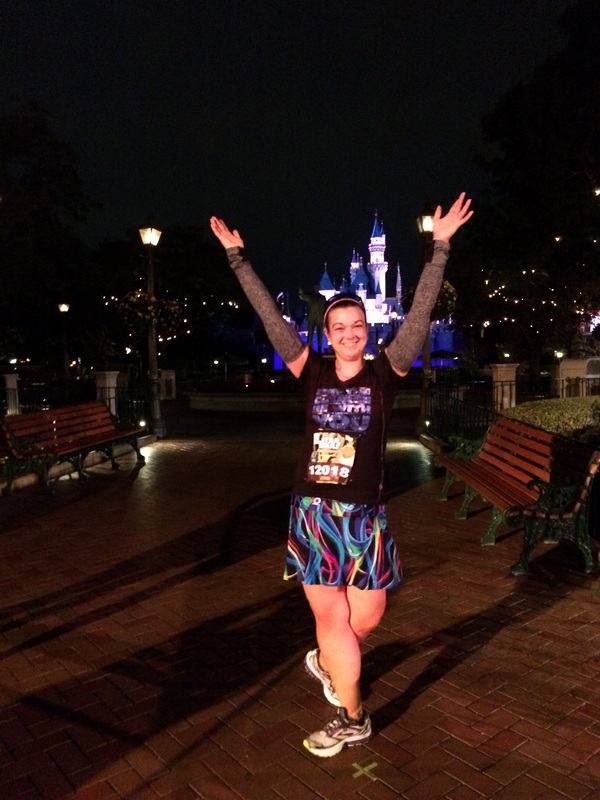 I don’t know if it was my self-talk or my muscles warming up or the magic of entering the parks, but my legs and brain got themselves sorted out around mile 2 and things were seriously fun from that point on! I stopped for an official photo in front of the castle before continuing on through Frontierland like we had the day before. The lines for Chewie and Darth Vader were again crazy long, so I was very glad I’d done Darth Vader the day before. 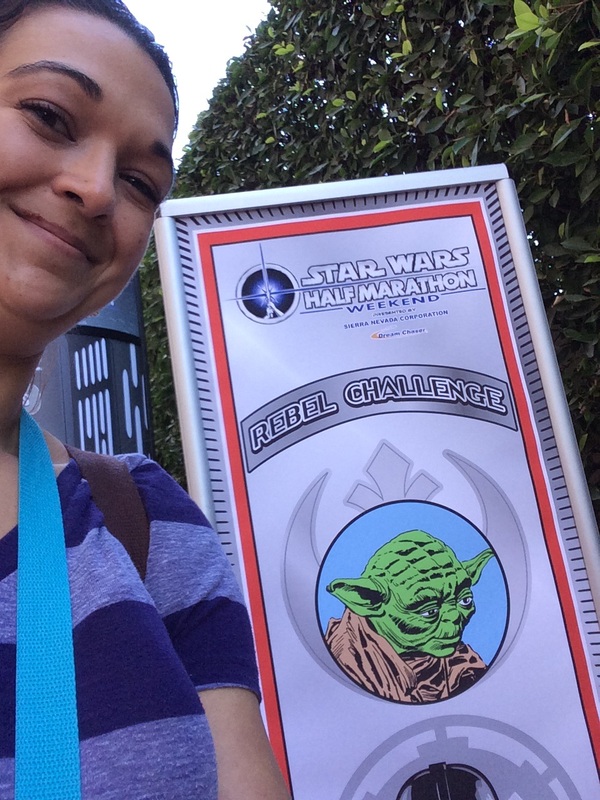 With my legs finally warmed up and shins not hurting, I didn’t want to wait in the long Chewie line as much as I’d have liked that picture. 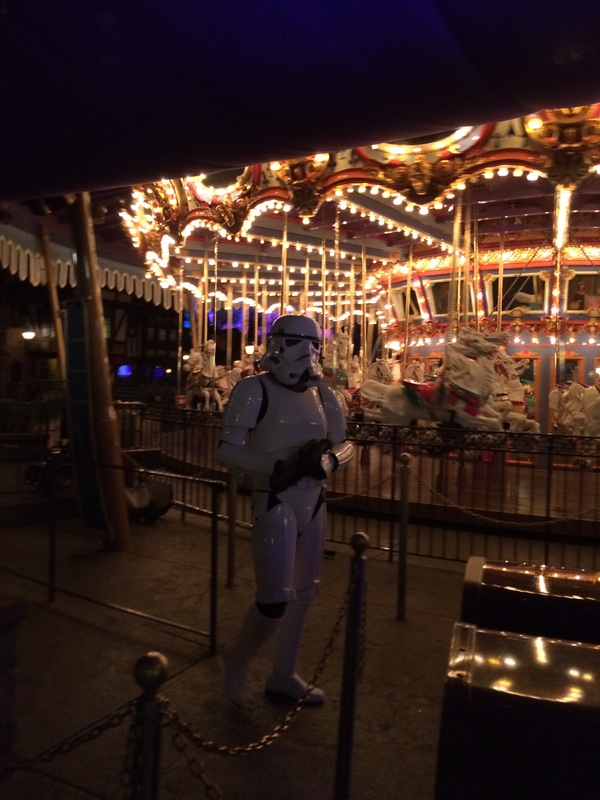 There were random Storm Troopers patrolling things like the carousel, which was a funny touch, and a photo stop with Luke and Leia, which I skipped because they really aren’t my favorites (the incestuousness of it not really my thing – if they’d thrown Hans in, I’d be totally on board!). We were discouraged from stopping for photos here, which I found a little odd. 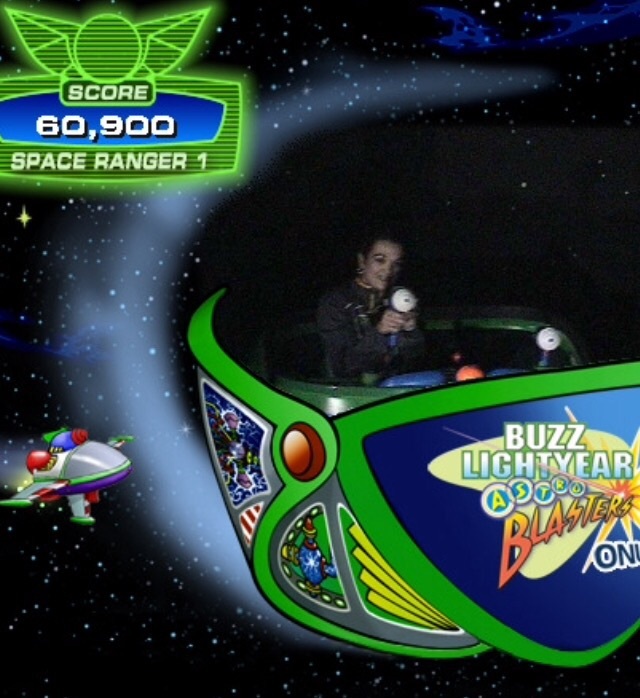 I’ve always loved seeing this picture from other people’s Disneyland races. If only World of Color had been operational! It was a gorgeous day to run, with cool weather, flat streets and mountains off in the distance. I thought I would be disappointed with the course once we hit Anaheim, but it was surprisingly great! 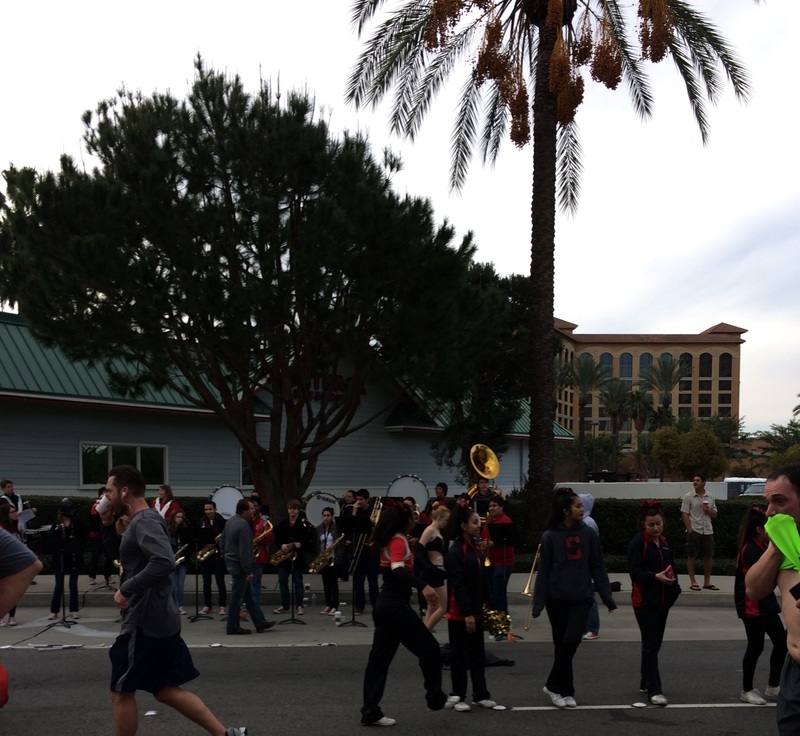 All along the route, there were cheerleaders and bands playing. I honestly didn’t need the music on my Shuffle and actually rarely noticed because there were always distractions around (in the best way). The crowds really thinned out on the streets as well, with plenty of room to run after the relative congestion of the first few miles. Loved this dancing guy at the fuel station! 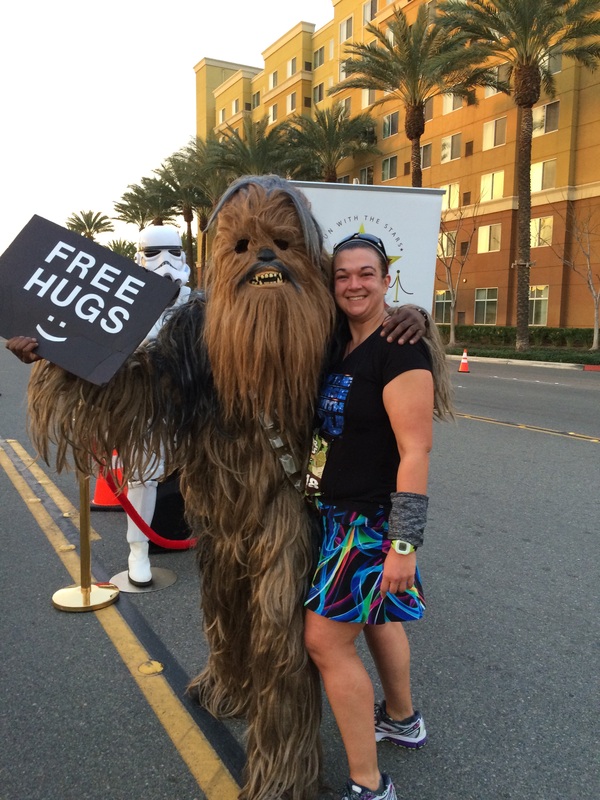 Along with the official fuel stop at around mile 8, there were lots of water stops with great volunteers (my favorite was the group making wookie noises) and lots of spectators passing out water and candy as well. There was even a group passing out orange wedges, which made the following quarter mile smell great thanks to the oranges littering the side of the road. Between miles 8 and 9, we had an endless string of costumed entertainment thanks to the fantastic 501st legion. They were fantastic! 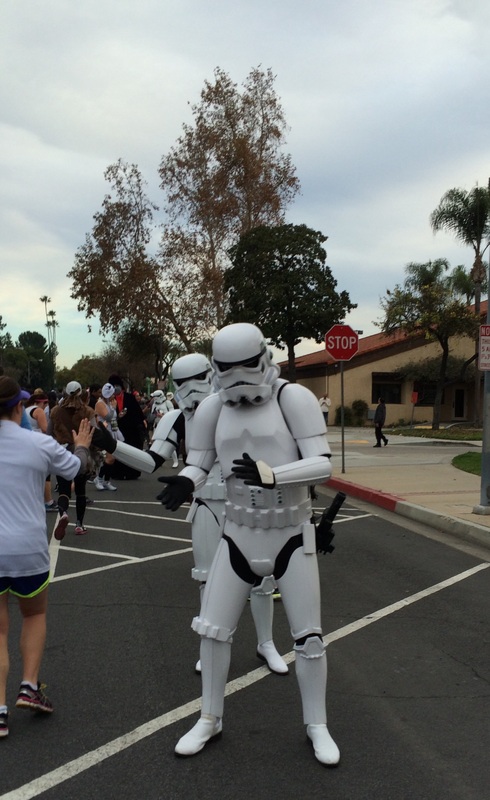 High fives from a long line of Storm Troopers is a great morale boost! 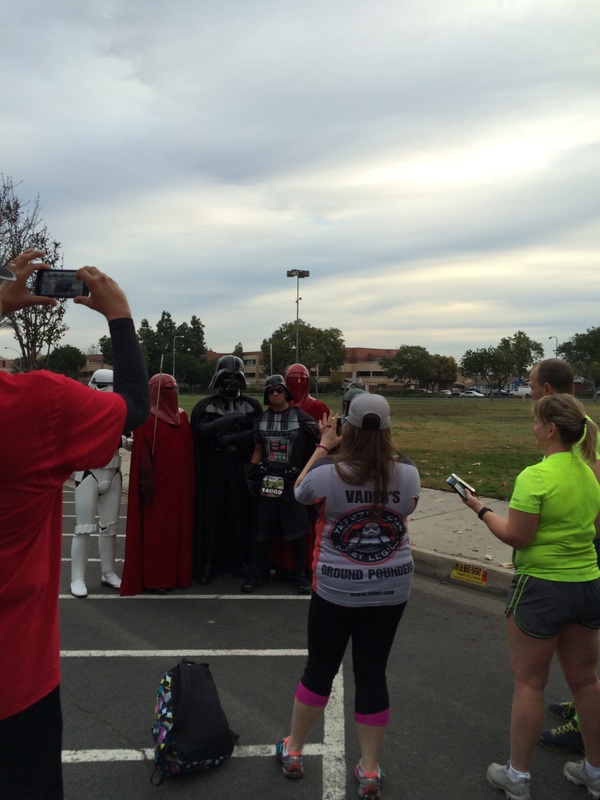 If I hadn’t gotten Darth on Saturday at the 10K, I totally would have gotten this guy. The amount of crowd support makes this a really FANTASTIC course. Before I knew it, we were heading back down the street towards the hotels and the finish line. At the very end, we wound through a parking lot, which would normally be a really boring way to almost end a race except for the all of the bands and cheerleaders. 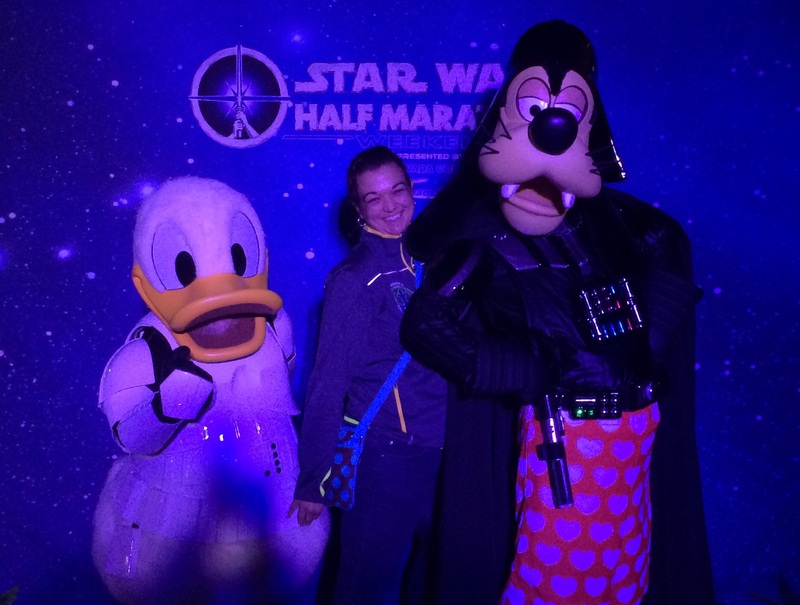 I was able to finish strong, which was a great mental victory for me, and sneak in a high five with Darth Goofy at the finish line (was a little disappointed that this was the only place we saw the Star Wars themed Disney friends). Final time: 2:50 with 13 minute mile pace overall, but according to hubby watching my splits, I was definitely getting faster as I went along. 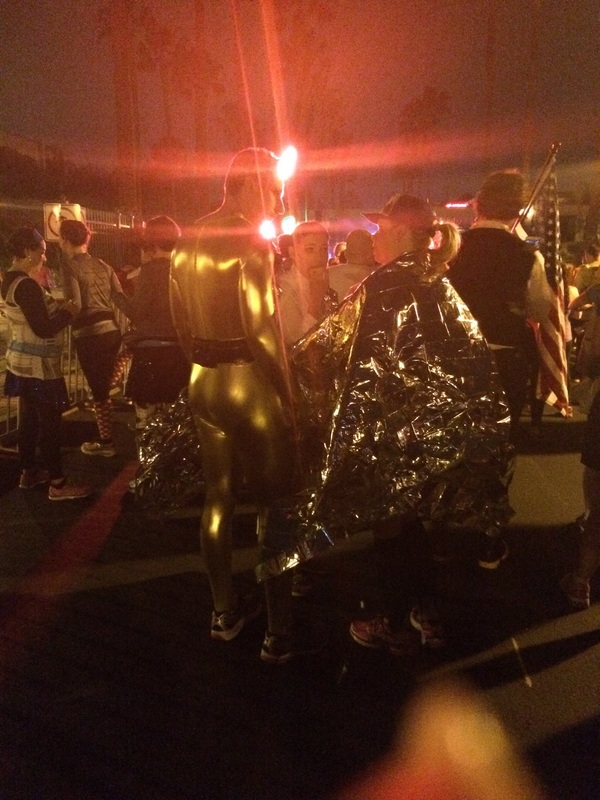 RunDisney learned their lesson from the bad social media chatter about the lack of foil blankets at marathon weekend, because they had loads for us as soon as we finished. I really appreciated that as the breeze was a little chilly! I got my half marathon medal and my blanket before heading over to the Rebel Challenge booth. 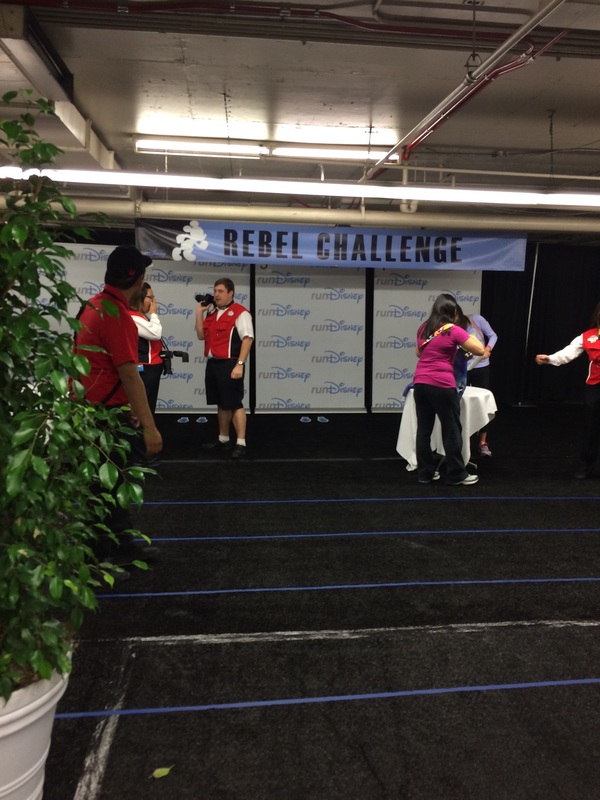 At the Expo, they’d taken our photos for the Rebel Challenge but skipped the wrist bands that had been used with other challenges. Instead, after finishing the half, we went to stand of the timing mat and a volunteer with a computer confirmed that I matched the picture associated with that bib and that the bib had finished both races. There wasn’t any confirmation like this after the 10K, so I wonder how they keep one person from running the 10K with the bib and another from running the half? Regardless, I took my two medals and happily headed off for drinks and snacks. 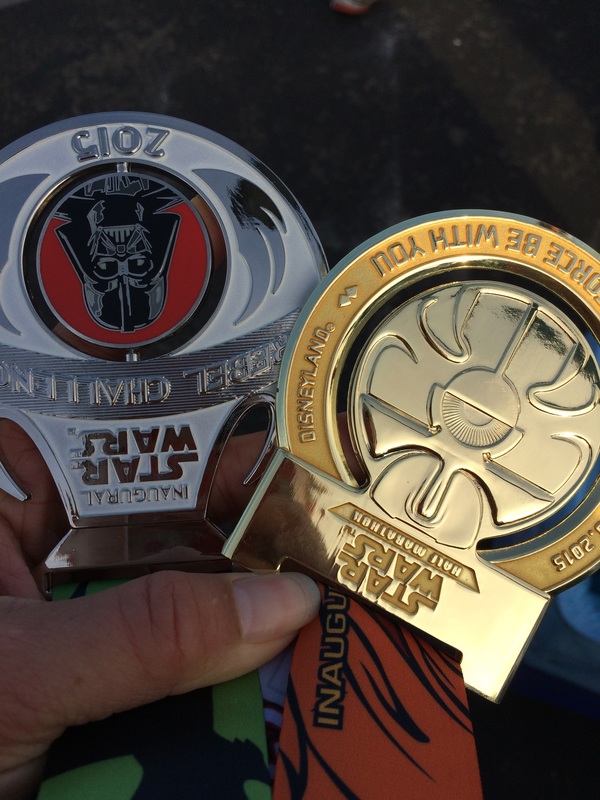 In case you’re wondering, the back to back races are totally worth it for the extra bling. 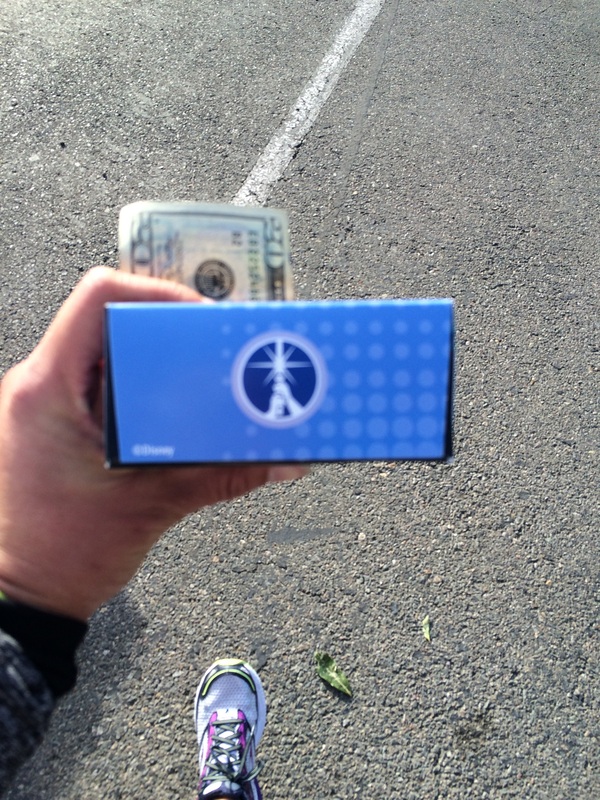 Cash in hand for a more substantial post race snack and COFFEE. There was a big post race area with a band, but I headed out with a friend to get some more substantial food. A friend from school was also at the race and we actually ended up running together from miles 3 on, which was interesting. It was my first time running with someone else. Thankfully we both agreed that we were taking the race easy, with walk breaks when we felt like it, and permission to run off and leave the other when we got near the finish line if so inclined. 🙂 The distraction of someone else definitely made the miles go quickly, beyond the usual chatting with other random runners as you went along (although I enjoyed some of that too). All in all, it was a great race experience. Perfect weather, fantastic easy course to run with lots of entertainment. I was worried I’d be disappointed in the half course because so much was off property (and would therefore not have any Disney-official stuff after the first few miles), but I wasn’t AT ALL. 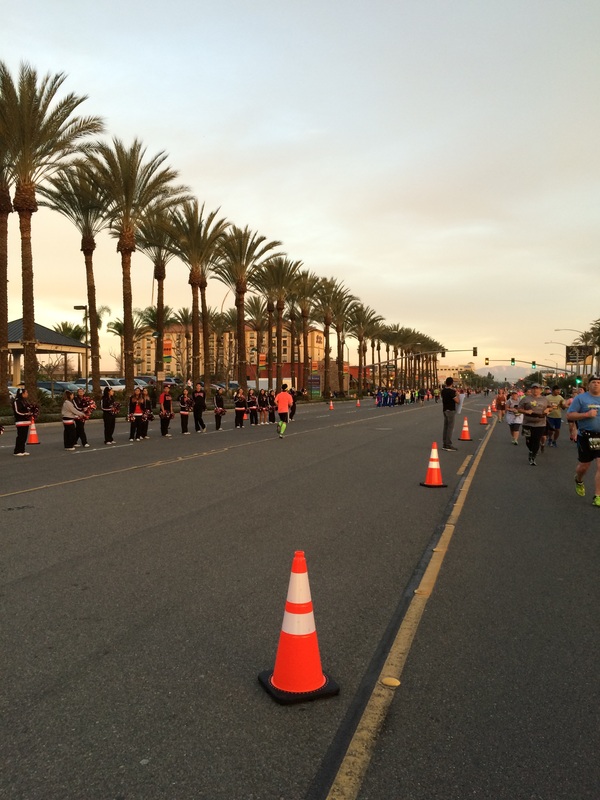 The community of Anaheim does a great job supporting the runners. I also really liked doing the 10K first and getting to take so many pictures during that race so I didn’t feel bad about skipping long lines with the half. A half marathon is long enough without adding a hour of pictures. 🙂 I worried that the parks part of the half marathon would be less fun since I’d just run most of it the day before, but the magic of running through a Disney park really doesn’t get old. The challenge medal is a spinner with Yoda and Darth Vader. I’ve completed 3 half marathons in the last 365 days. How crazy is that? When did I become that person? I’ll have more posts over the next two weeks about the back-to-back racing experience itself, the Expo, the Wookie Welcome party and working with a travel provider to book a race. You’ll probably get tired of hearing about all of it. 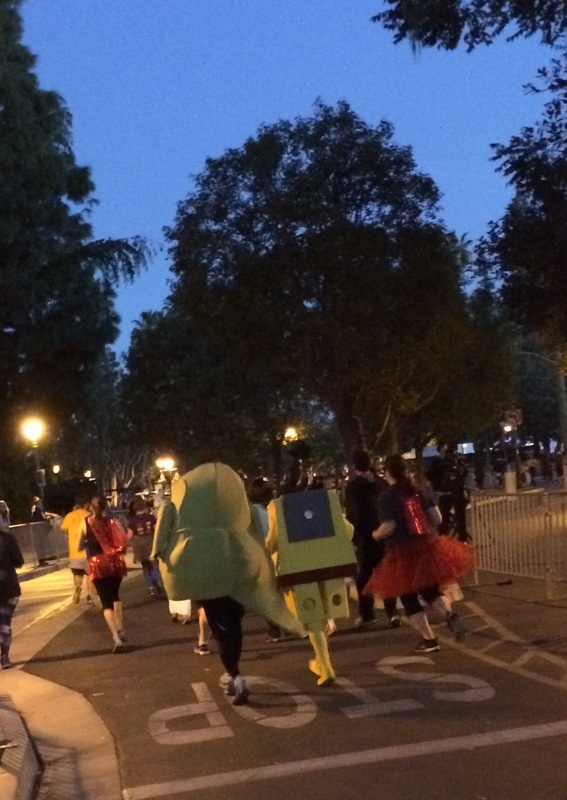 🙂 Plus, Friday’s Favorites this week will be devoted to the truly spectacular costumes the other runners wore for all of the races. The creativity (and ability of people to run in those things!) was astounding and definitely one of the highlights of the weekend for me. Thanks to all of you for following along and cheering me on through the weekend! PS Also now at 22.4 miles of my 100 miles of races goal for 2015!